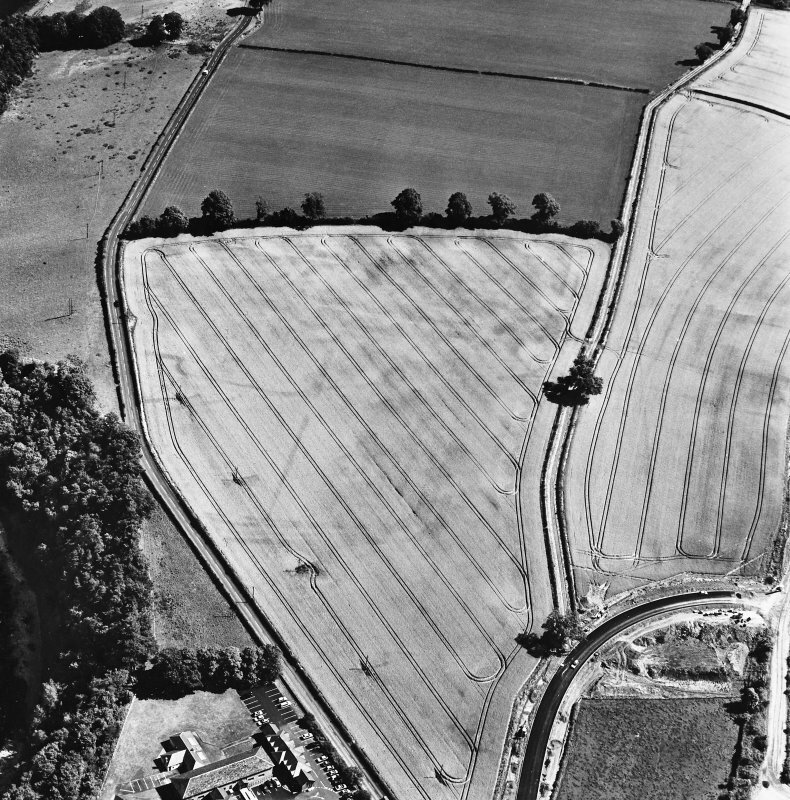 Oblique aerial view of Newstead centred on the cropmarks of the Roman fort, annexes, and Roman temporary camps, taken from the WNW. 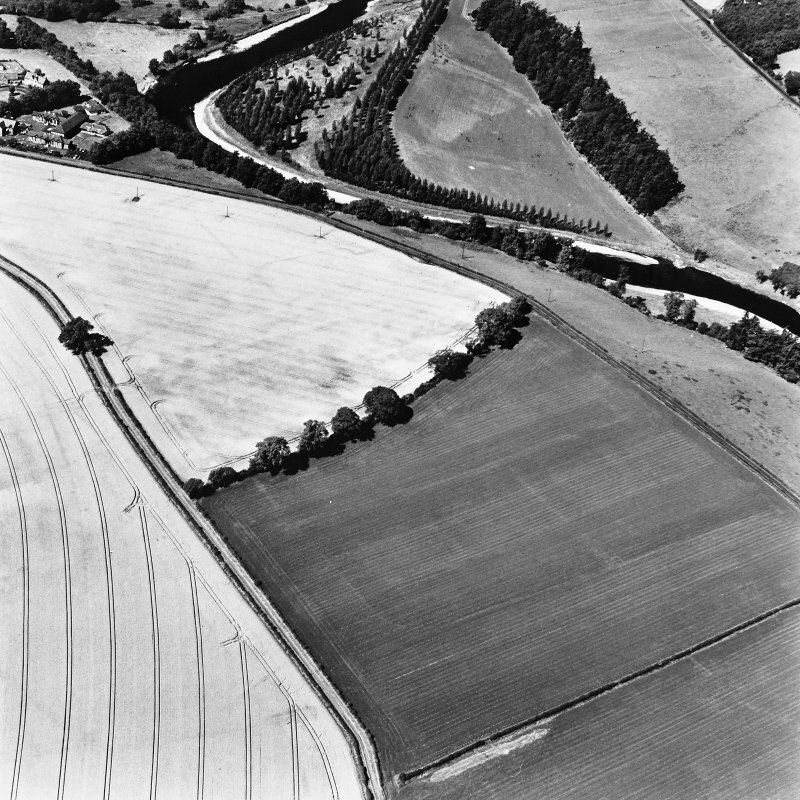 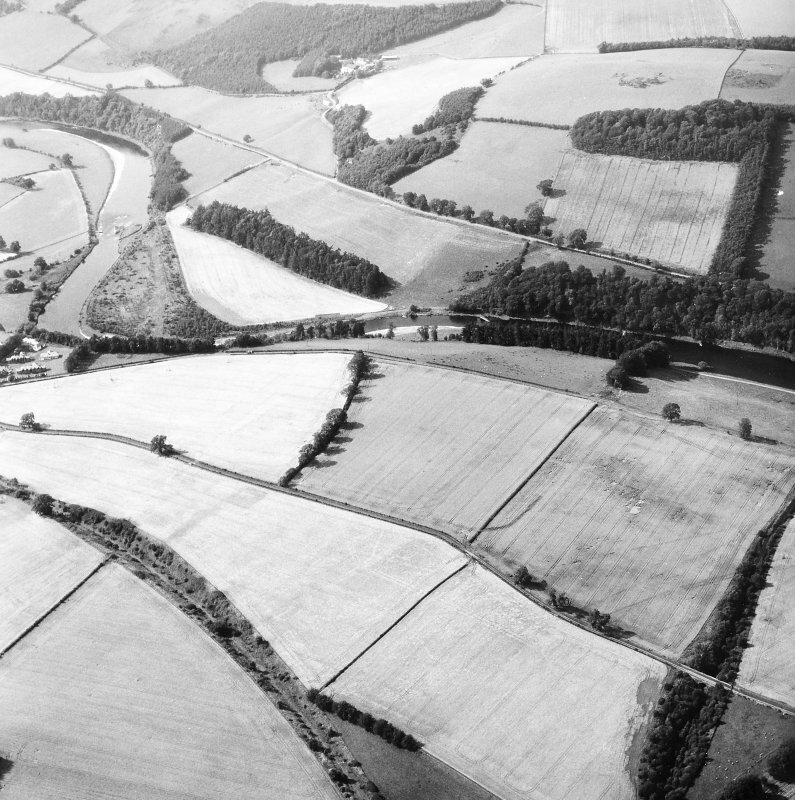 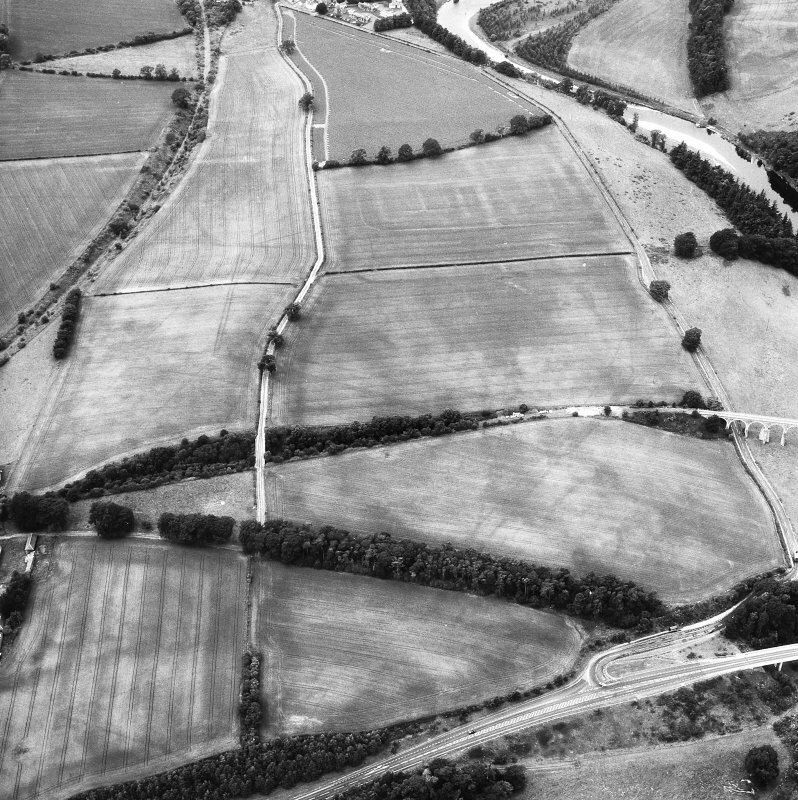 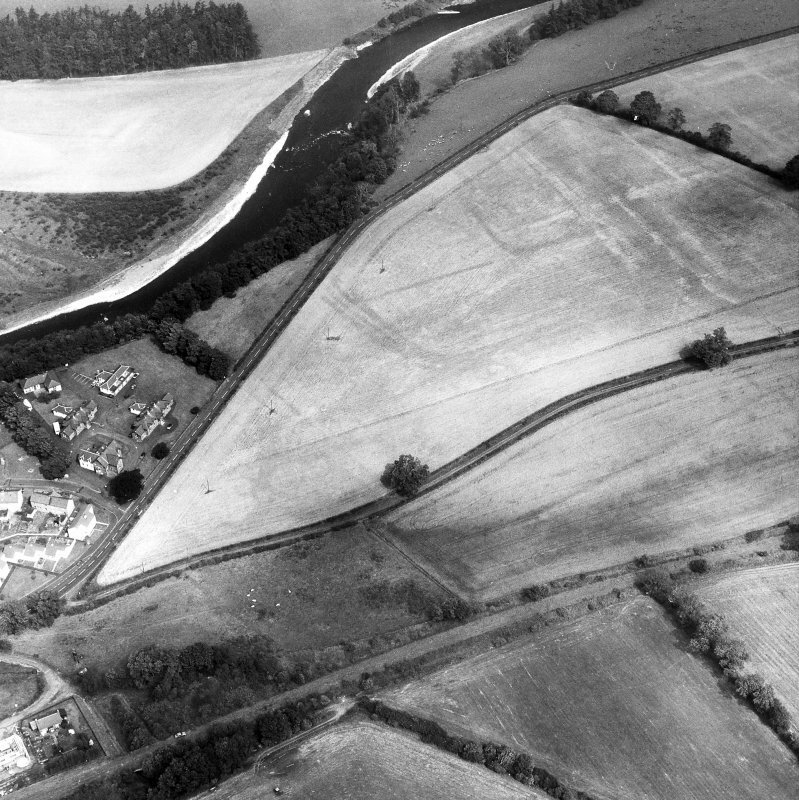 Oblique aerial view of Newstead centred on the cropmarks of the Roman fort, southern and western annexes, taken from the SW.
Newstead, Roman fort and temporary camps: air photograph showing fort (NT 569 344), Southern annexe (NT 569 341), Eastern annexe (NT 572 343) and annexe (NT 571 343). 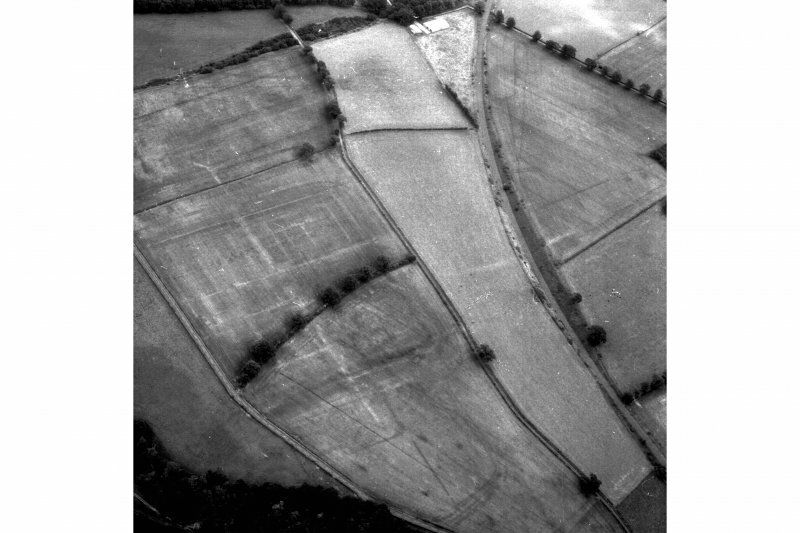 Oblique aerial view of the cropmarks of the Roman fort at Newstead, looking NE. 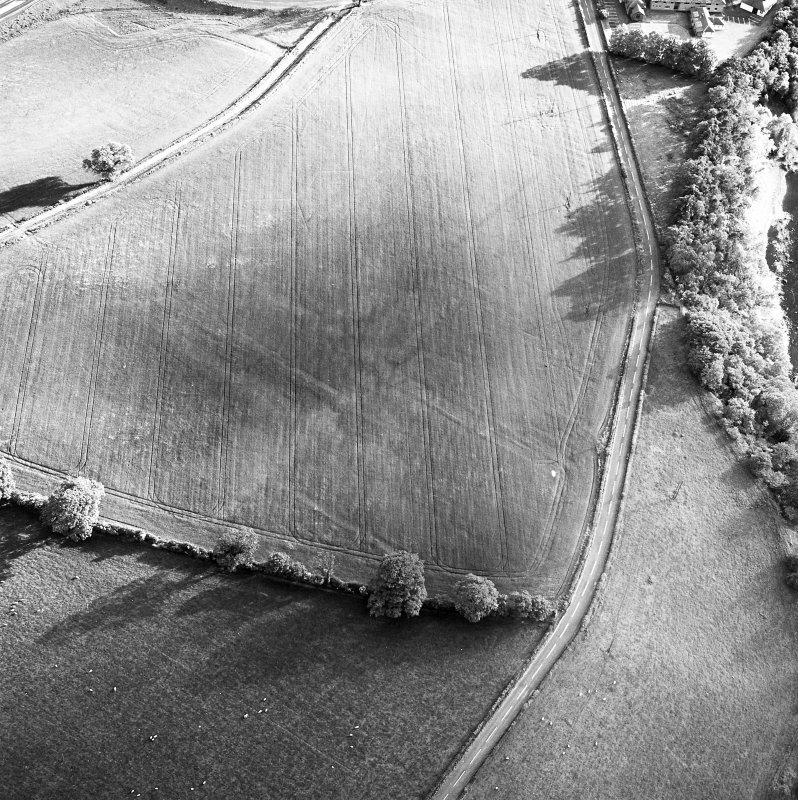 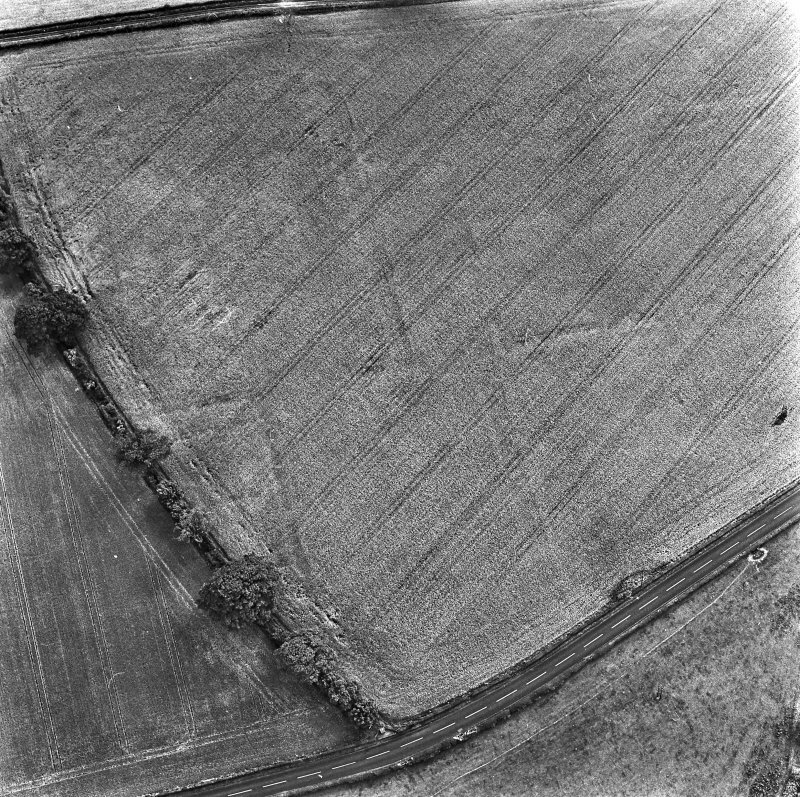 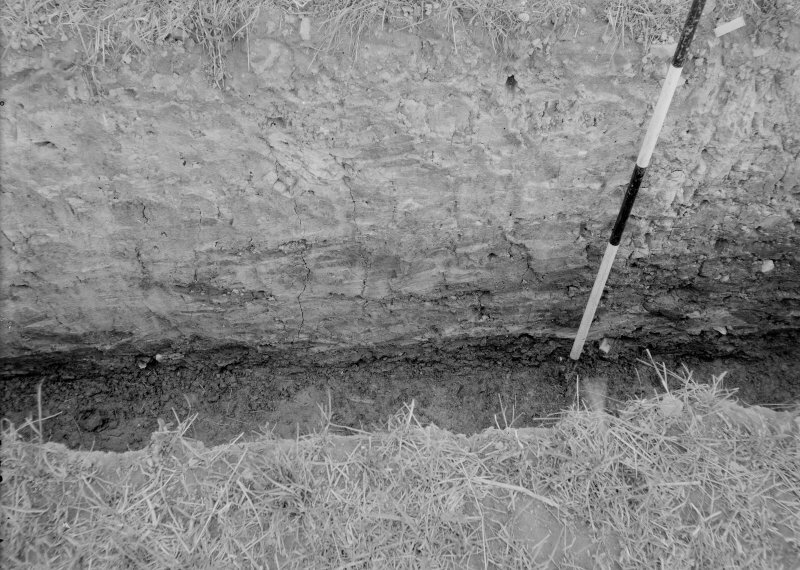 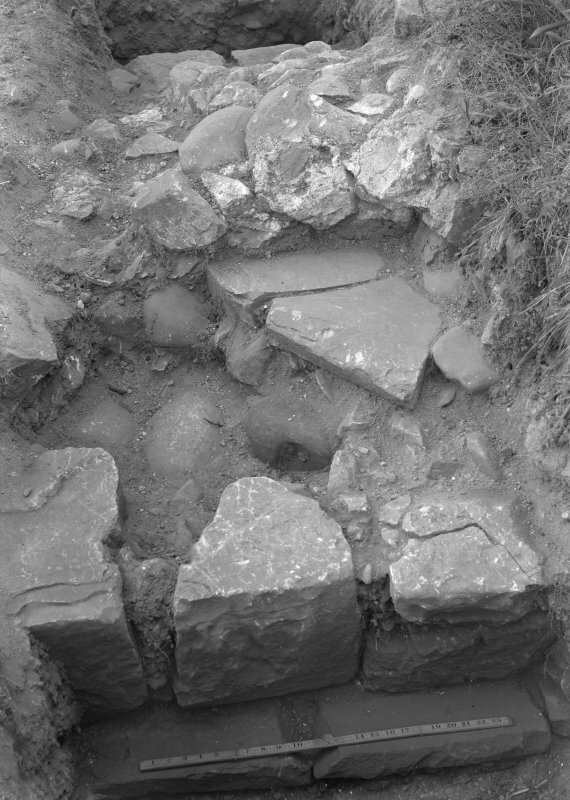 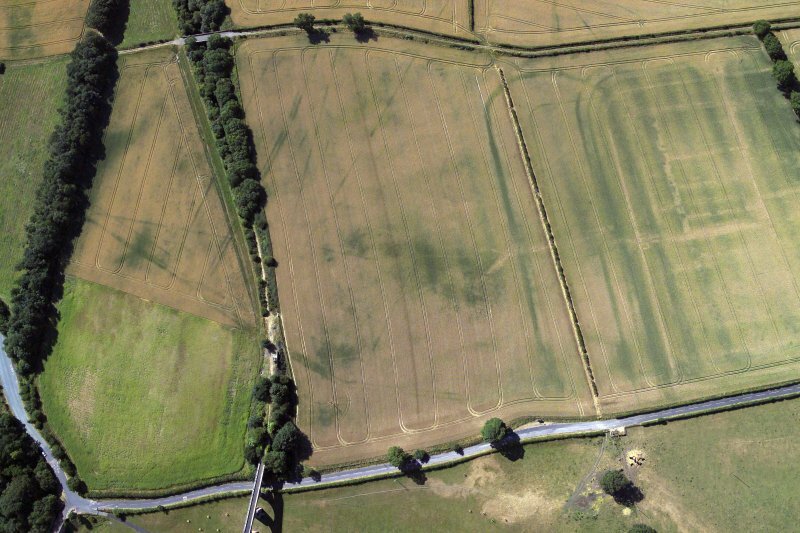 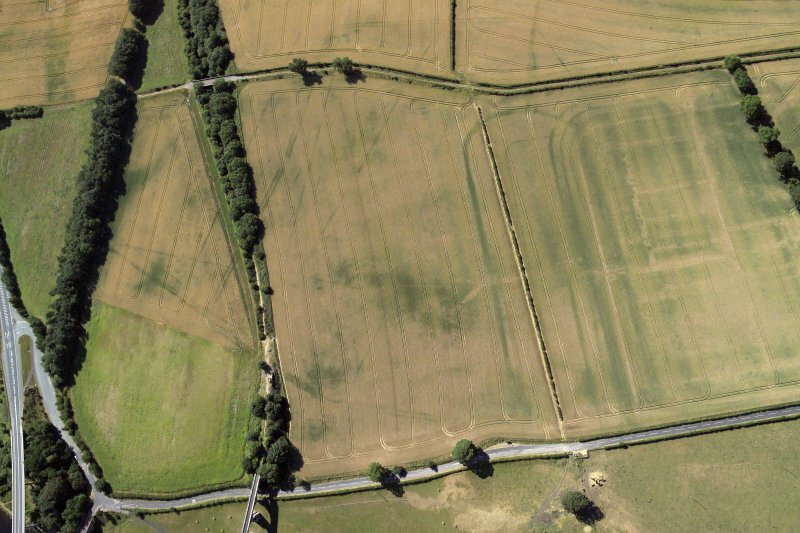 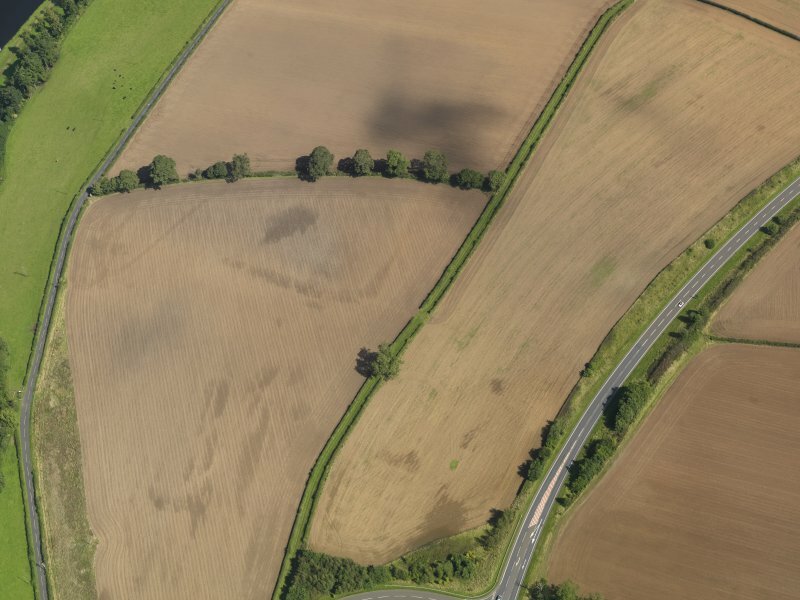 Oblique aerial view of the soilmarks of the W ditch of Newstead Roman fort, taken from the WSW. 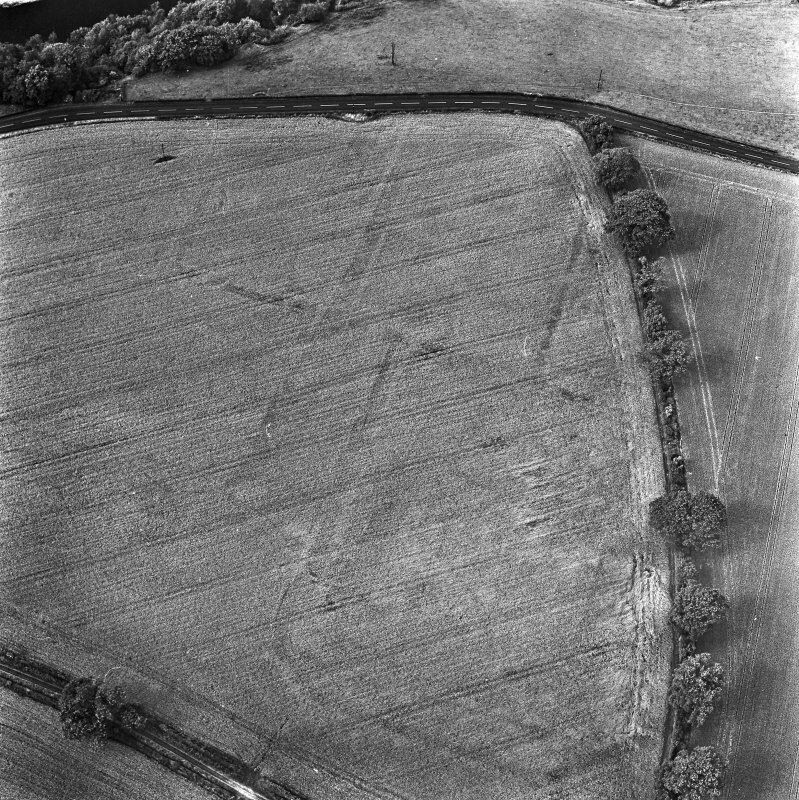 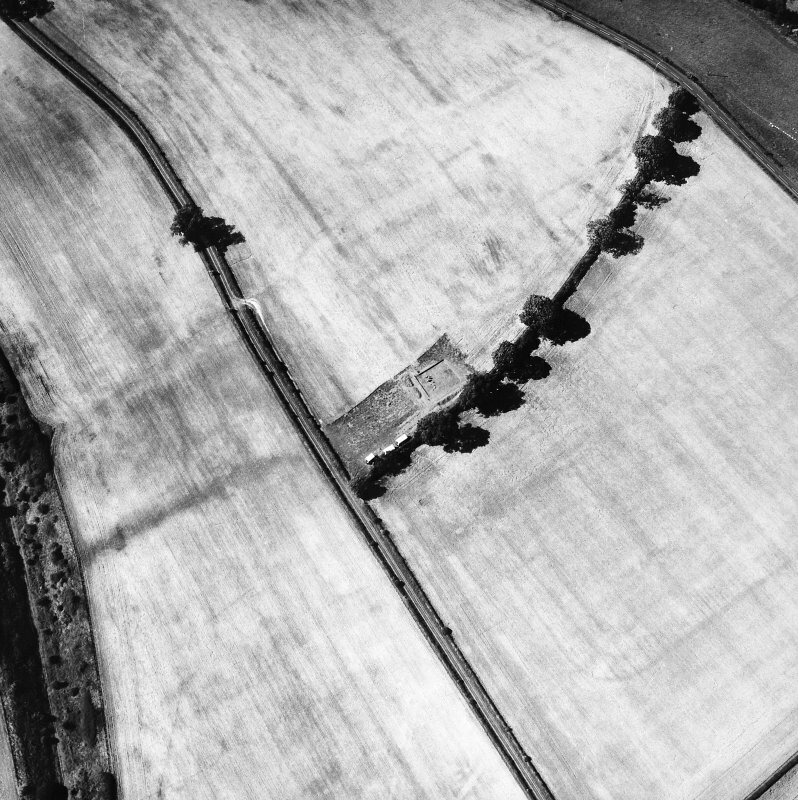 Oblique aerial view centred on the cropmarks of the Roman fort, Roman temporary camps and fort annexes, taken from the N.
Excavation photograph taken during the James Curle excavation 1905-1909. 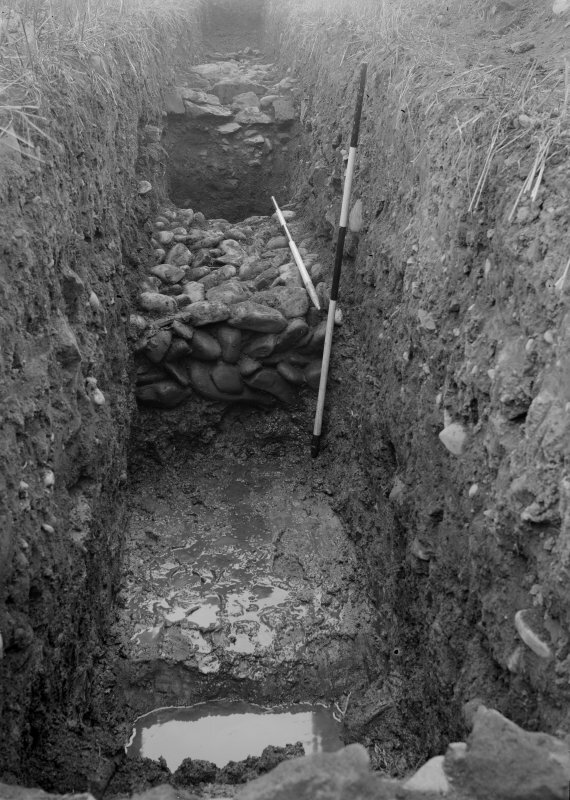 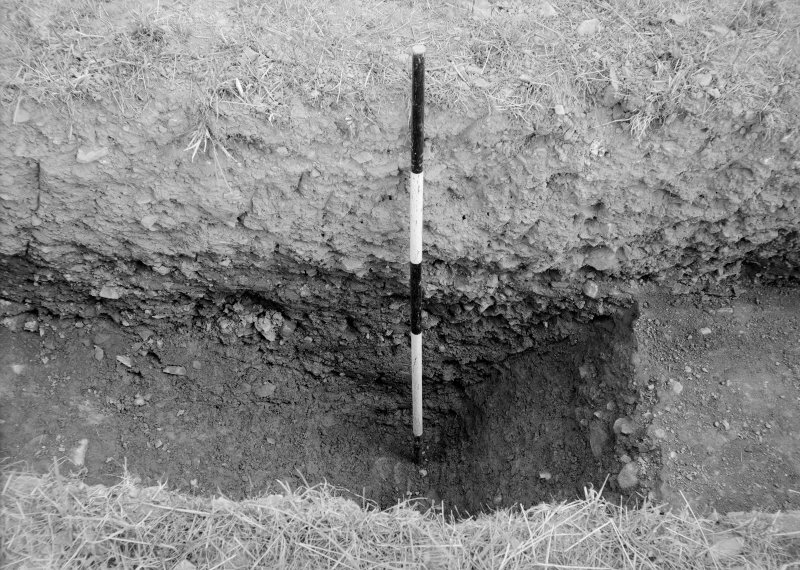 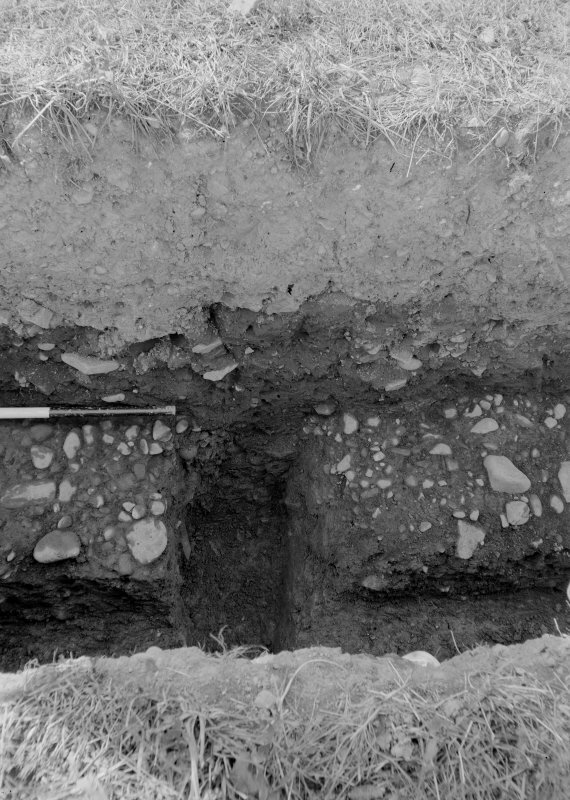 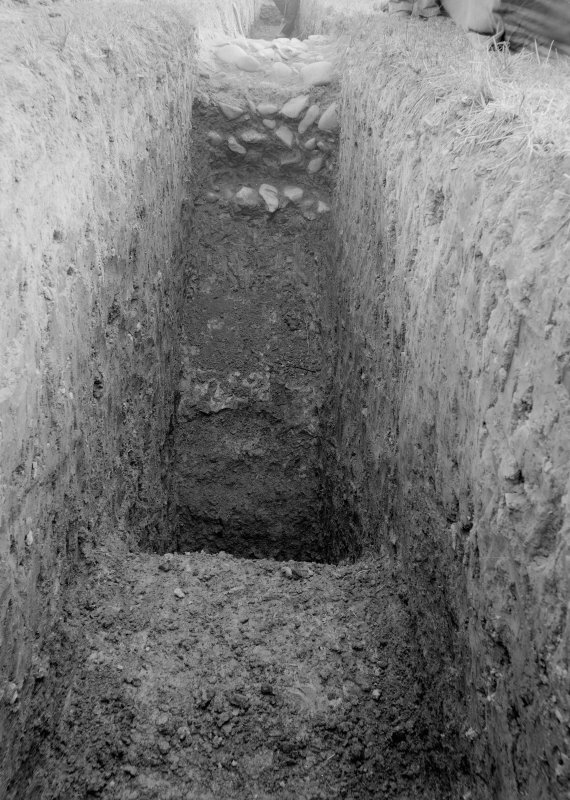 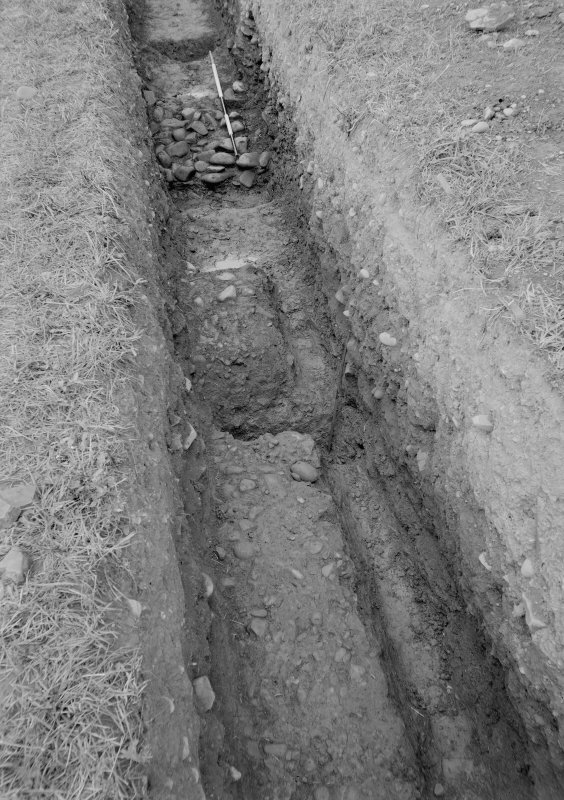 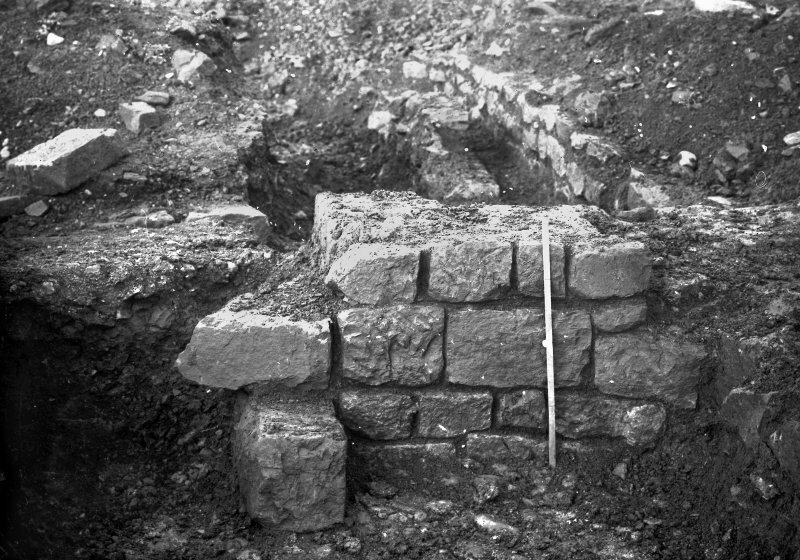 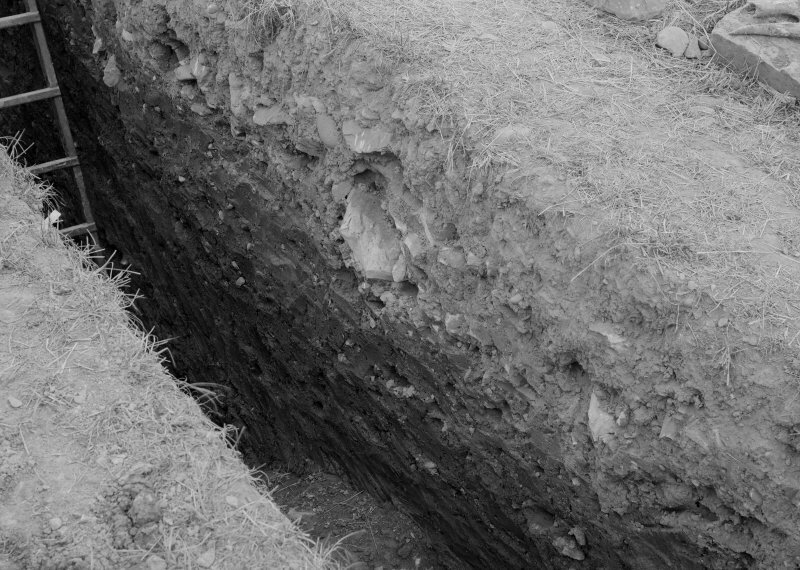 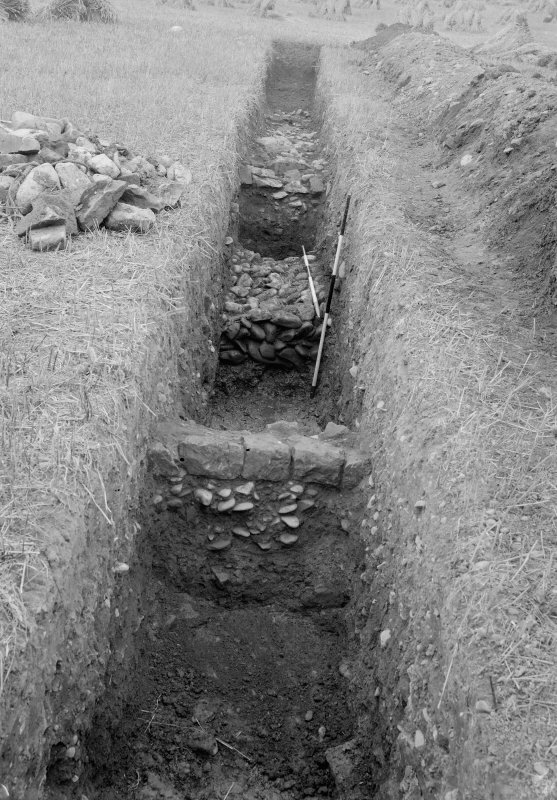 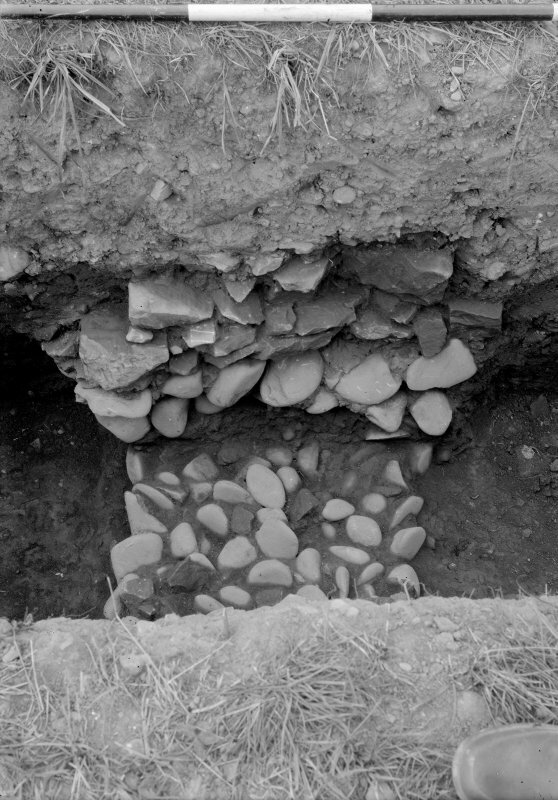 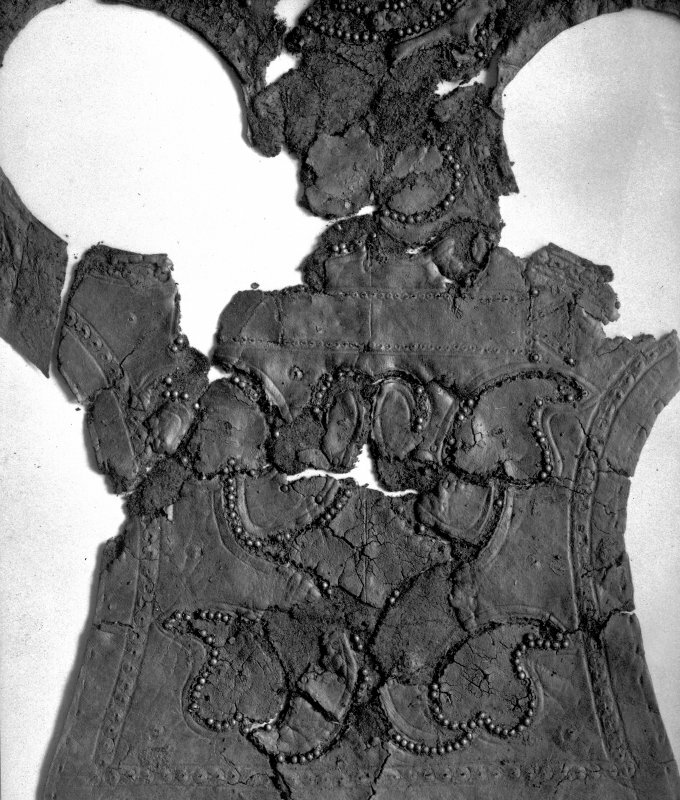 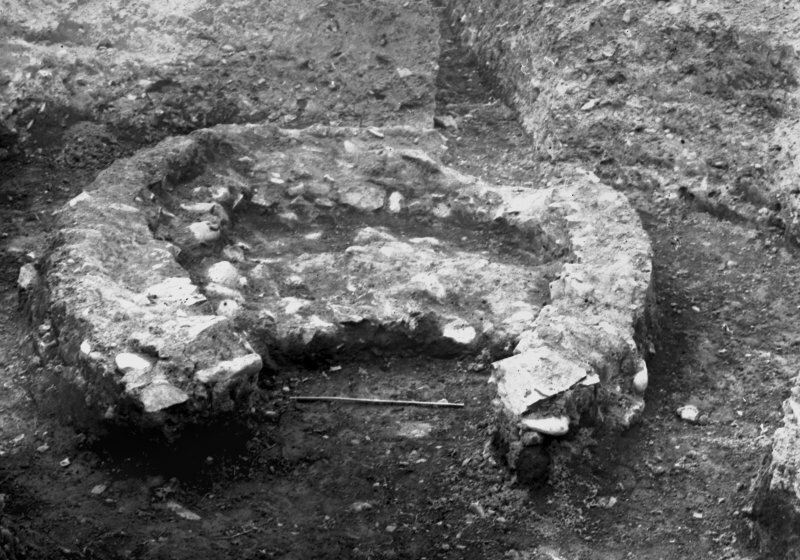 View of artefact from the James Curle excavation 1905-1909. 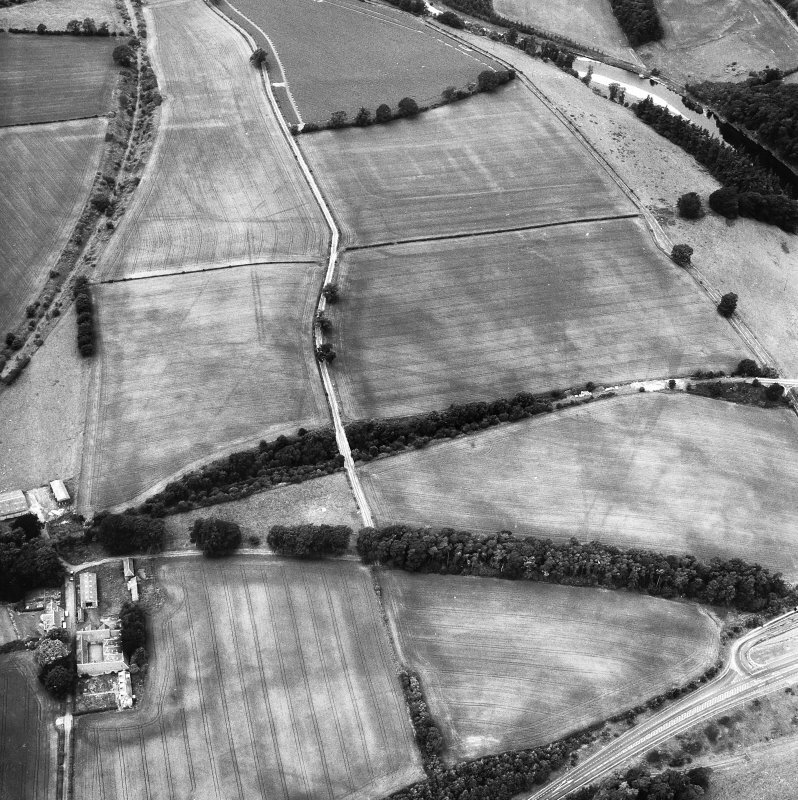 Oblique aerial view of Newstead centred on the cropmarks of the Roman fort, annexes, and Roman temporary camps, taken from the NNW. 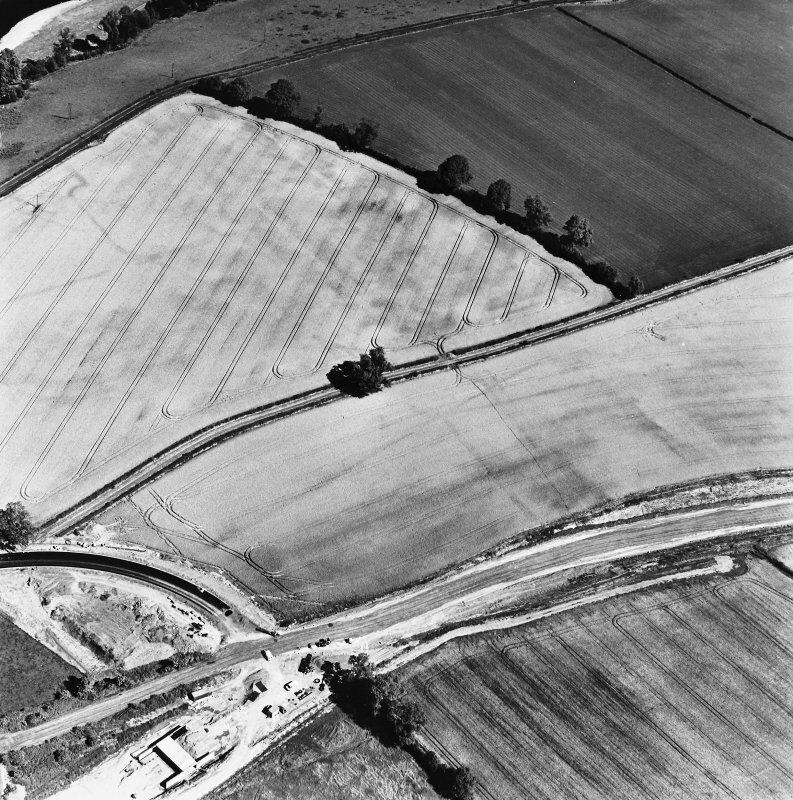 Newstead Roman fort and western annexe, oblique aerial view, taken from the N.
Newstead Roman fort and western annexe, oblique aerial view, taken from the ENE. 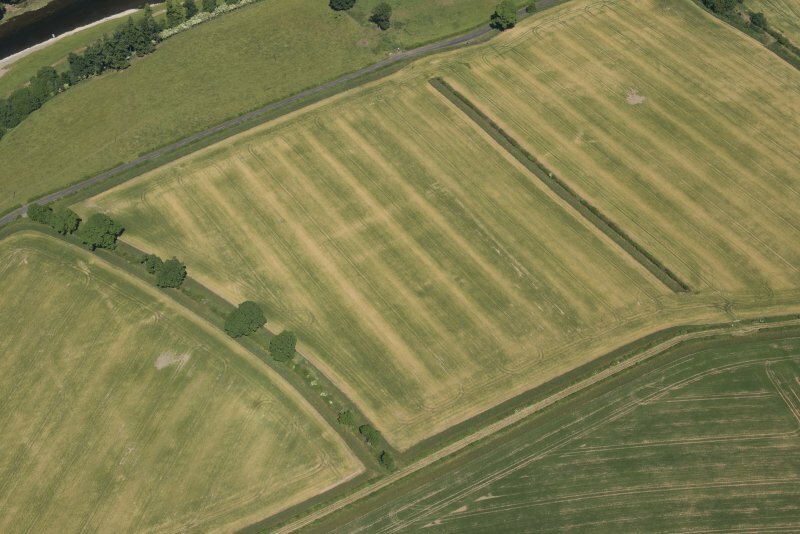 Newstead, oblique aerial view, taken from the NW, centred on the Roman fort and western annexe. 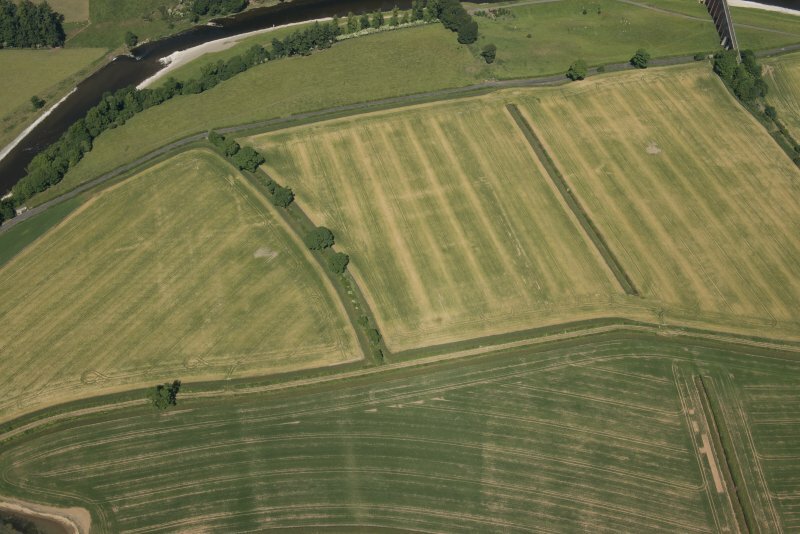 Newstead, oblique aerial view, taken from the SW, centred on the Roman fort and the western and southern annexes. 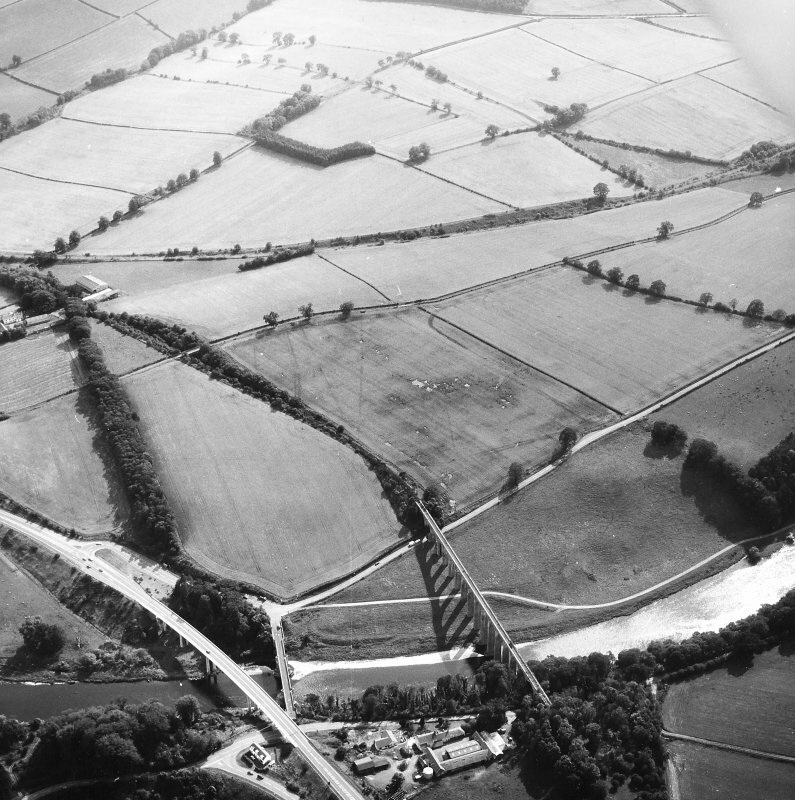 The Newstead by-pass (under construction) is visible in the bottom half of the photograph. 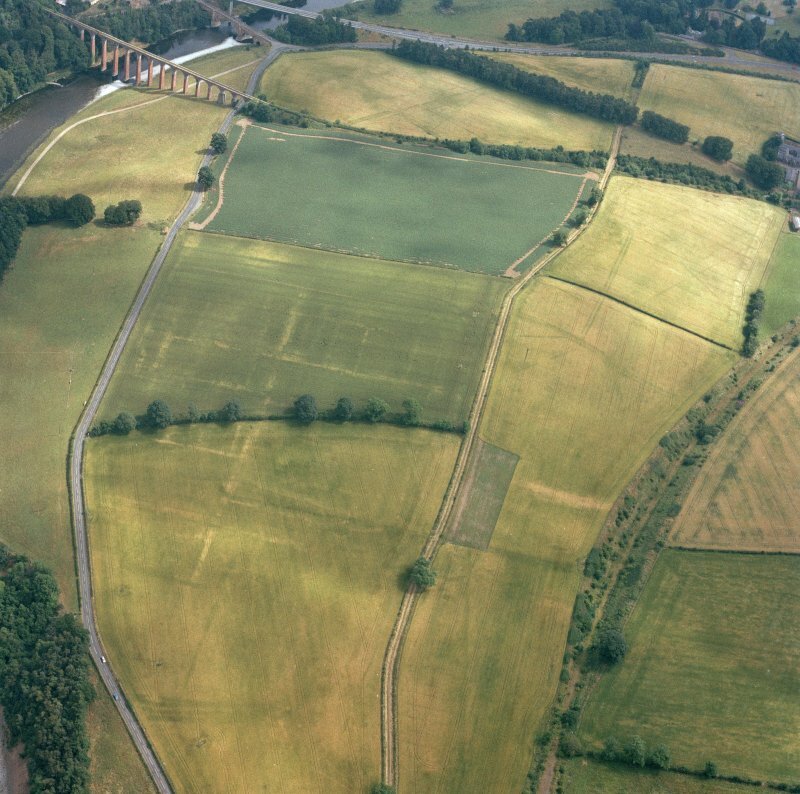 Newstead, oblique aerial view, taken from the W, centred on the Roman fort and the western and southern annexes. 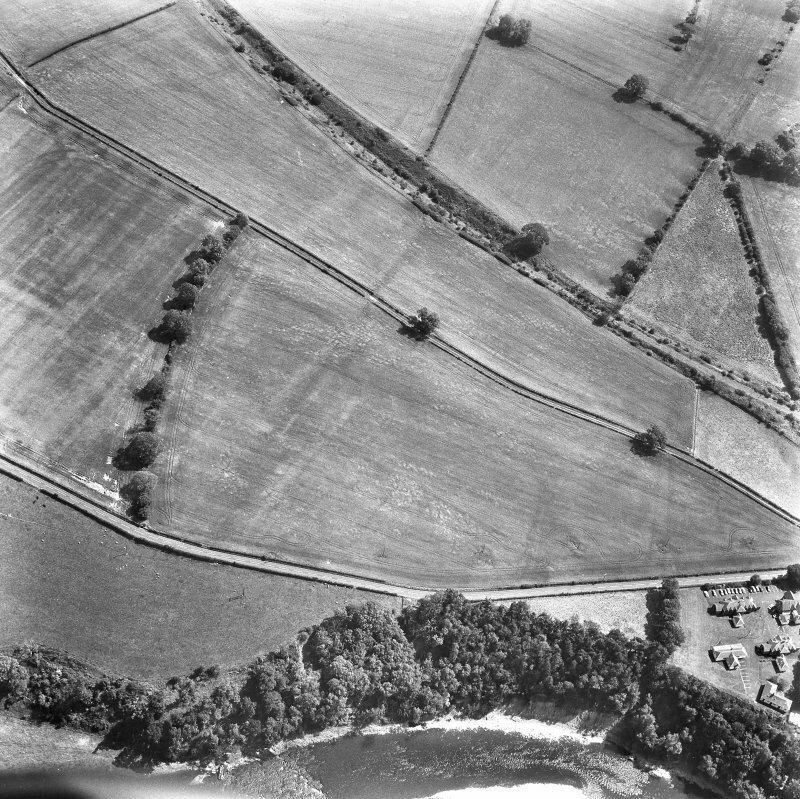 Newstead, Roman fort and temporary camps: air photograph showing Eastern annexe (NT 572 343), Southern annexe (NT 569 341), Western annexe (NT 569 341), annexe (NT 571 343) and possible annexes (NT 569 342 and NT 570 346). 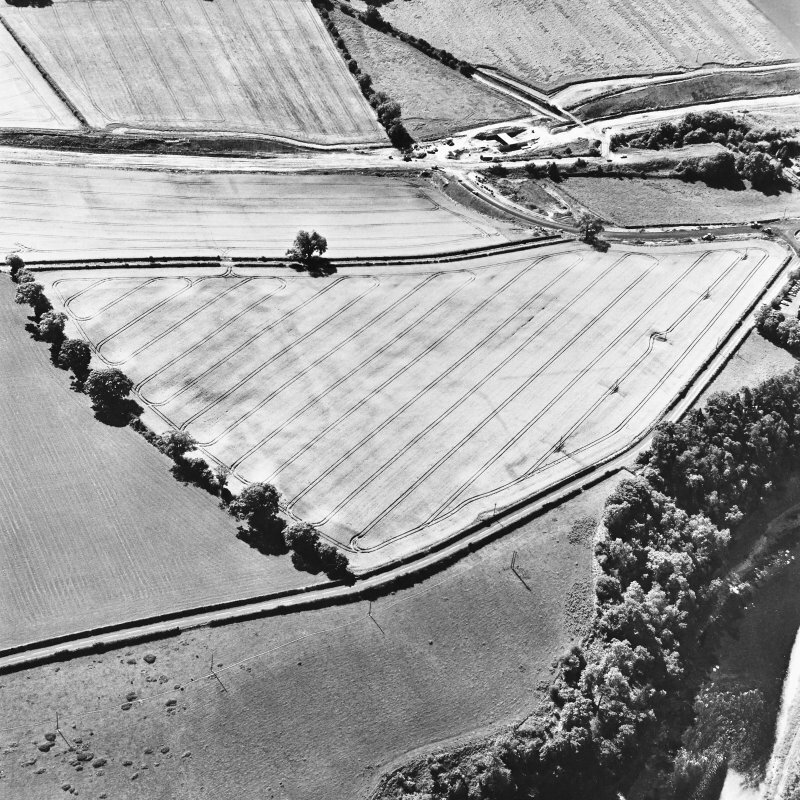 Oblique aerial view centred on the cropmarks of the Roman fort, Roman temporary camps and fort annexes, taken from the NNW. 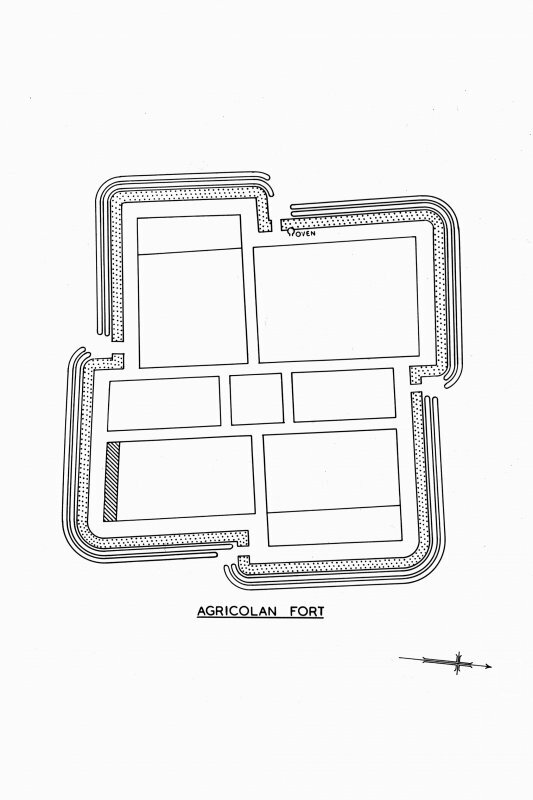 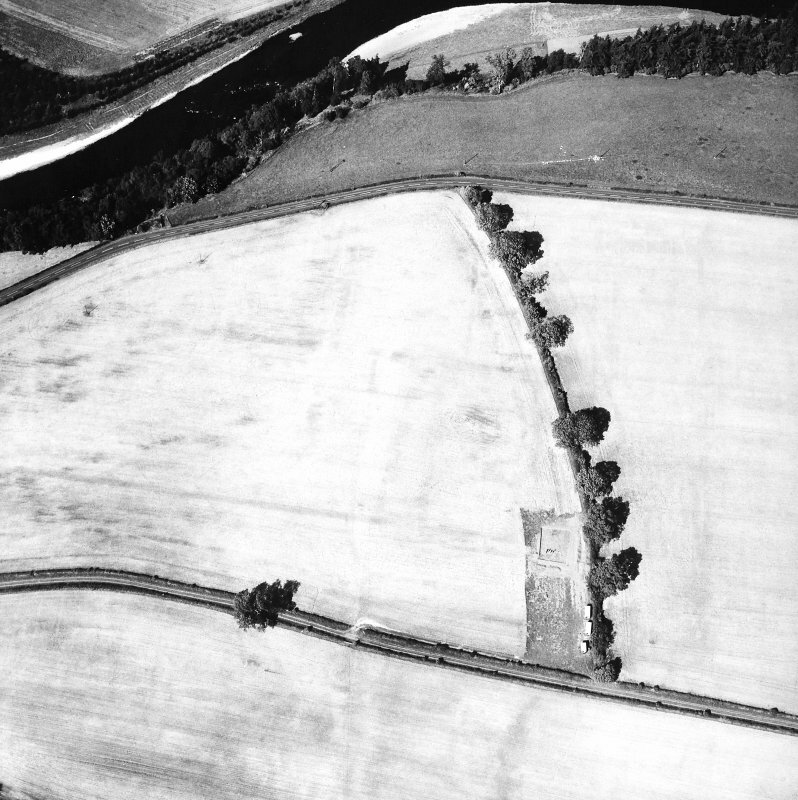 Oblique aerial view centred on the cropmarks of the Roman fort and fort annexes, taken from the ENE. 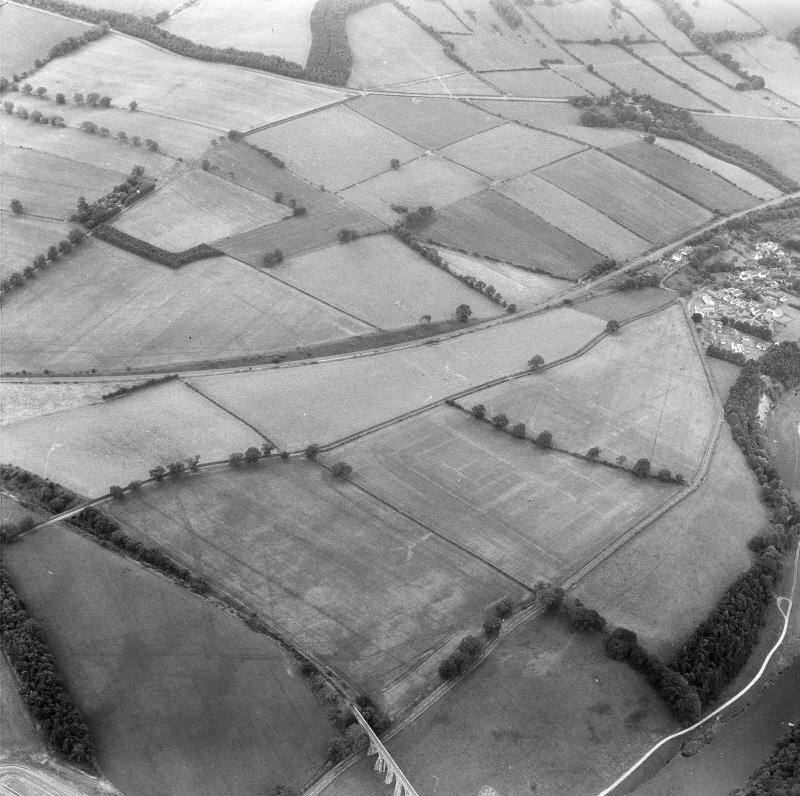 Oblique aerial view of Newstead centred on the cropmarks of the Roman fort, eastern and southern annexes, enclosure and Roman temporary camps, taken from the SW.
Oblique aerial view of Newstead centred on the cropmarks of the Roman fort, annexes, and Roman temporary camps, taken from the W.
Oblique aerial view of Newstead centred on the cropmarks of the eastern annexe, enclosure and Roman temporary camps with Roman fort adjacent, taken from the SSE. 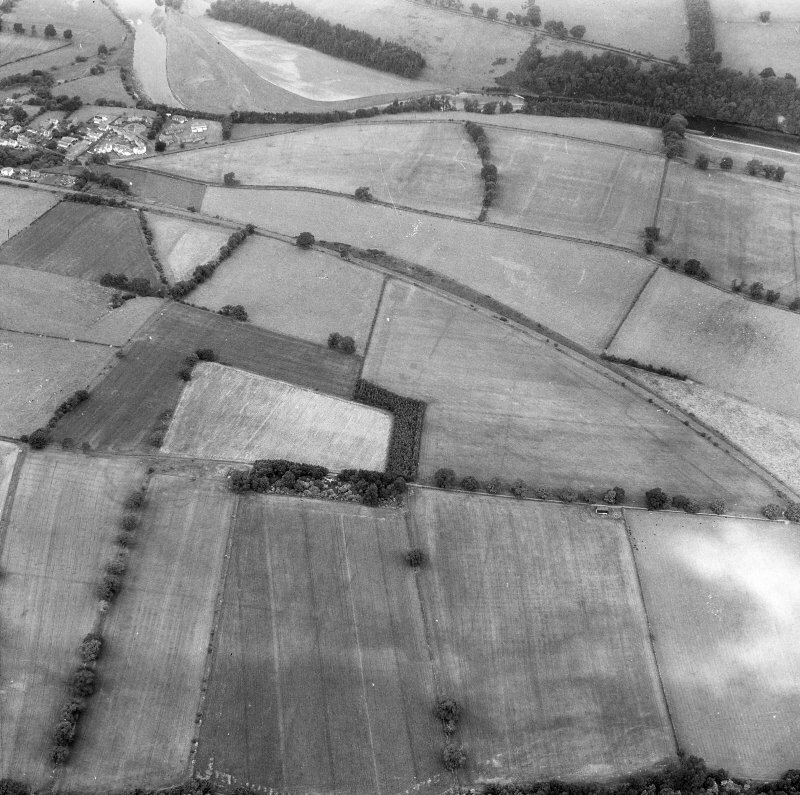 Oblique aerial view of Newstead centred on the cropmarks of the Roman fort, annexes, and Roman temporary camps, taken from the SW.
Newstead, oblique aerial view, taken from the SSW, centred on the cropmarks of the Great Camps Complex. 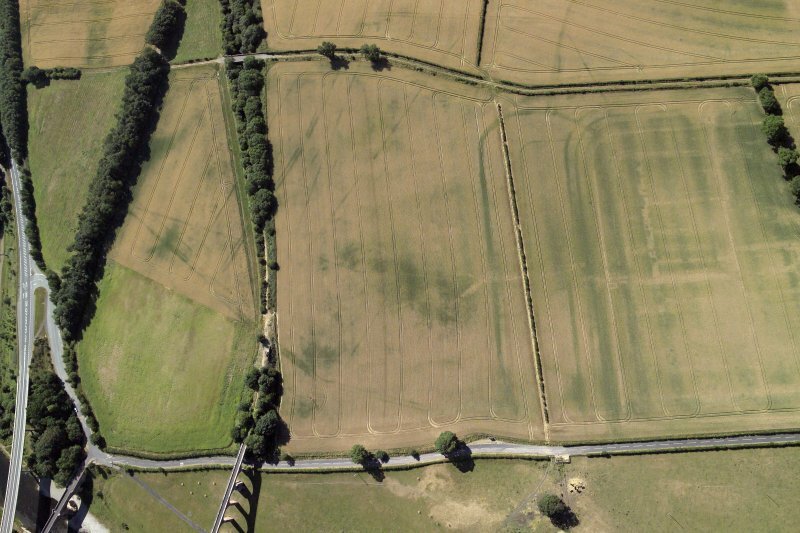 Newstead, oblique aerial view, taken from the SW, centred on the cropmarks of the Roman Fort and Southern Annexe. 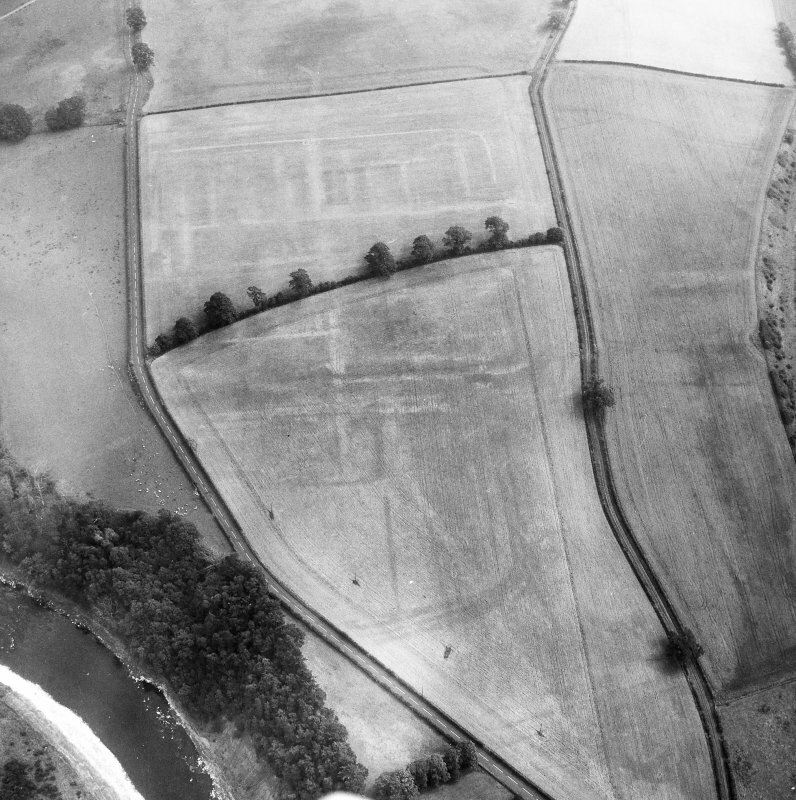 Newstead, oblique aerial view, taken from the S, centred on the Roman fort eastern annexe and 'great camps' complex. 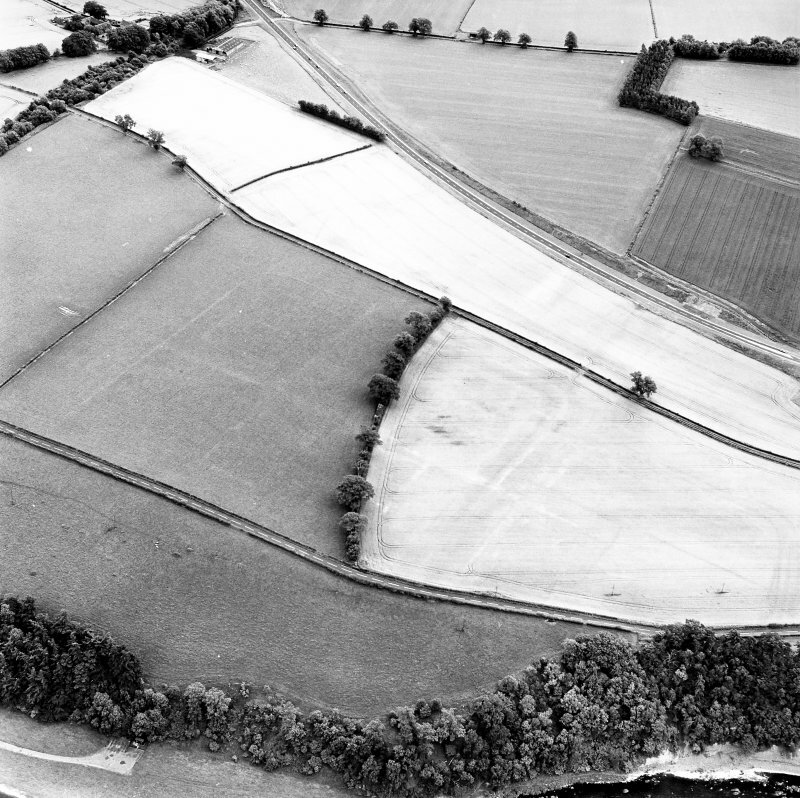 Newstead, oblique aerial view, taken from the ENE, centred on the Roman fort and the western and southern annexes. 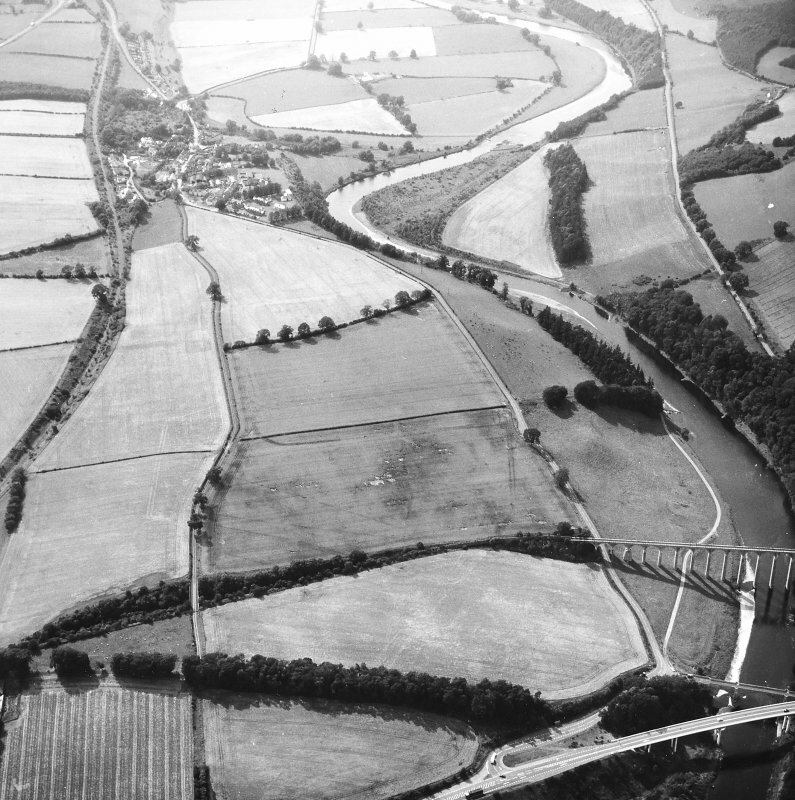 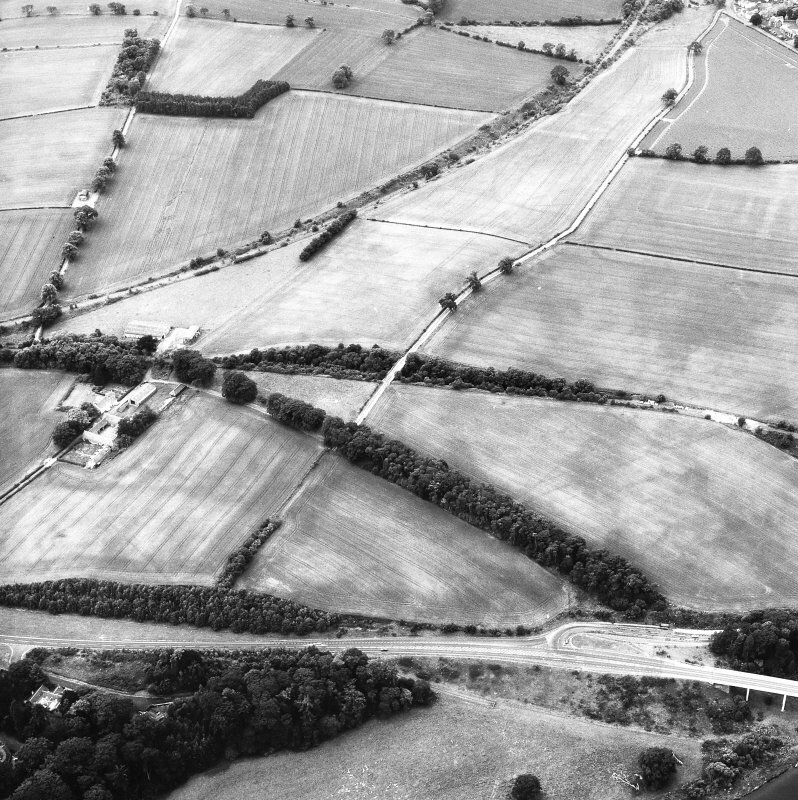 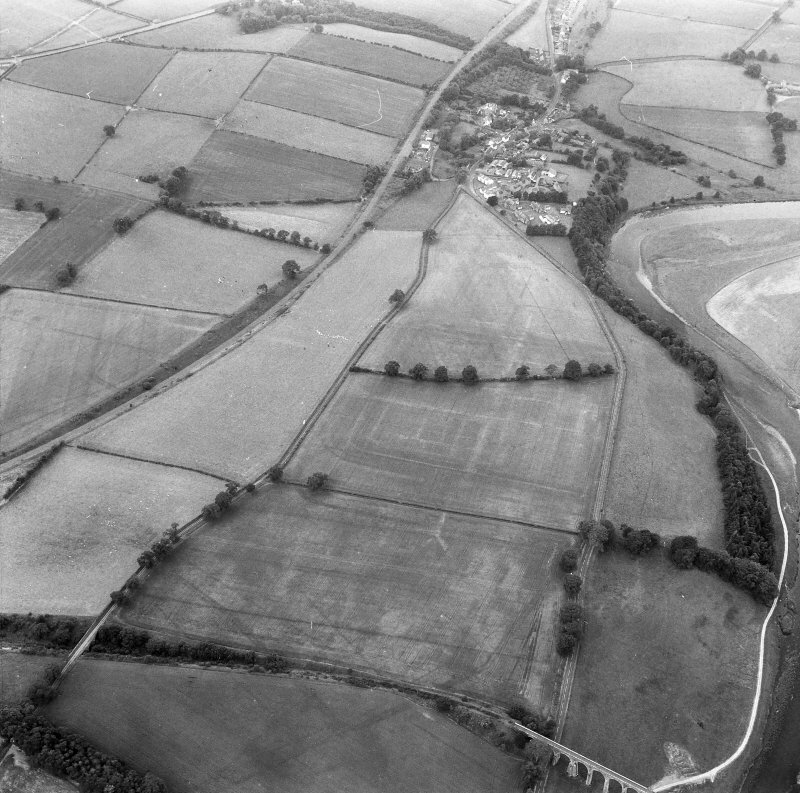 Newstead village and by-pass (under construction) are visible in the top right-hand corner of the photograph. 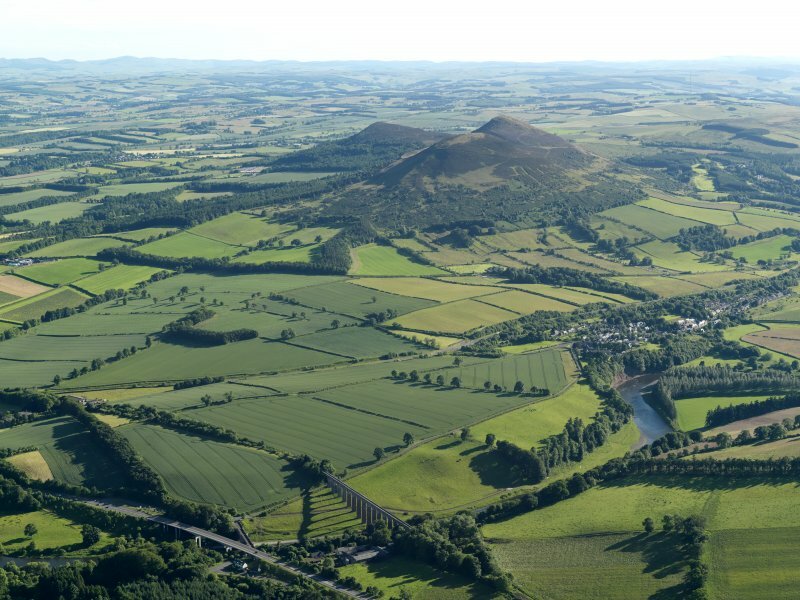 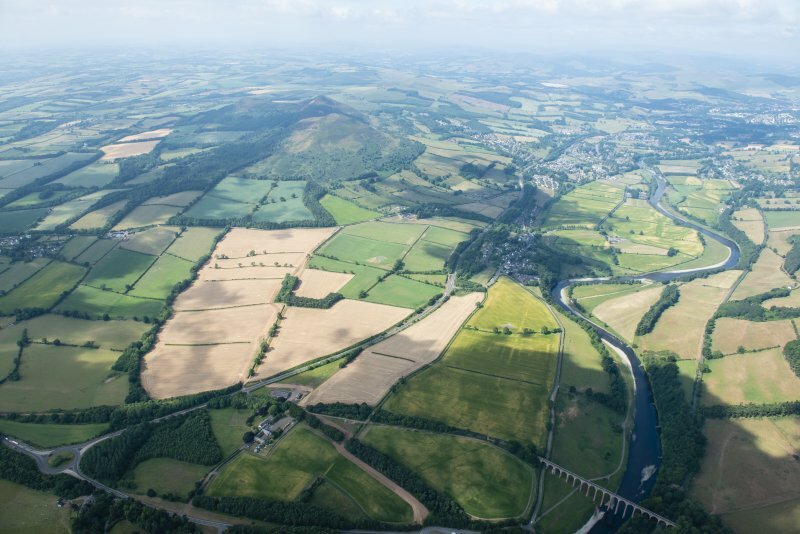 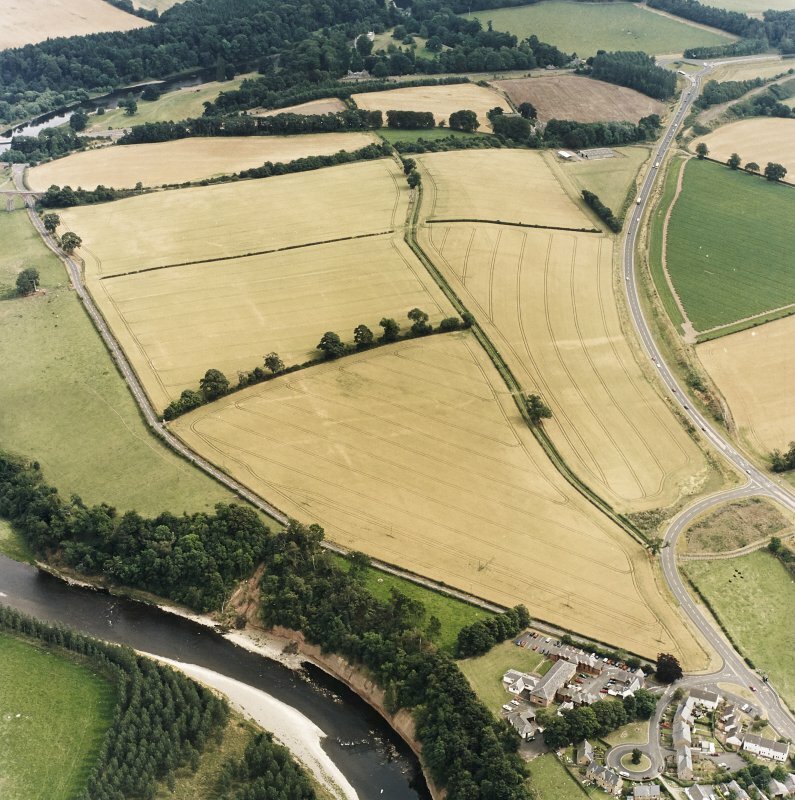 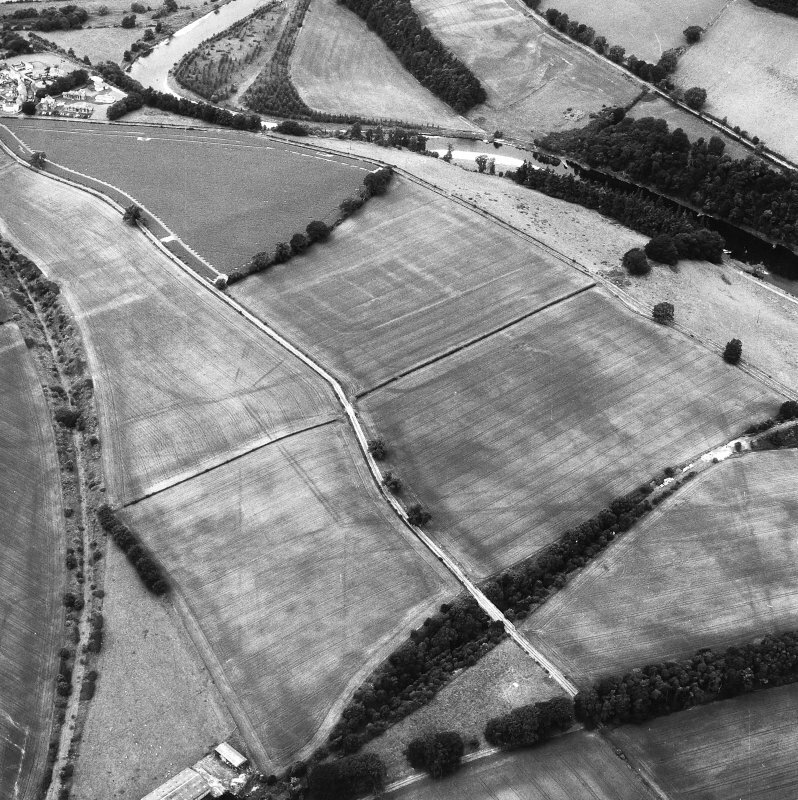 Newstead, oblique aerial view, taken from the NNE, centred on the Roman fort and the western and southern annexes. 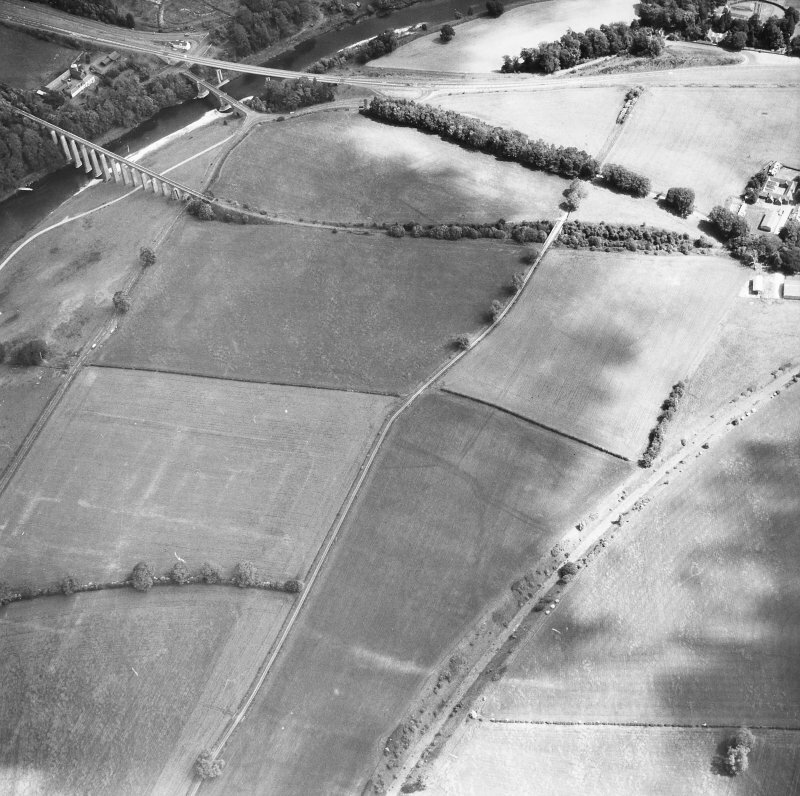 The Newstead by-pass (under construction) is visible in the top half of the photograph. 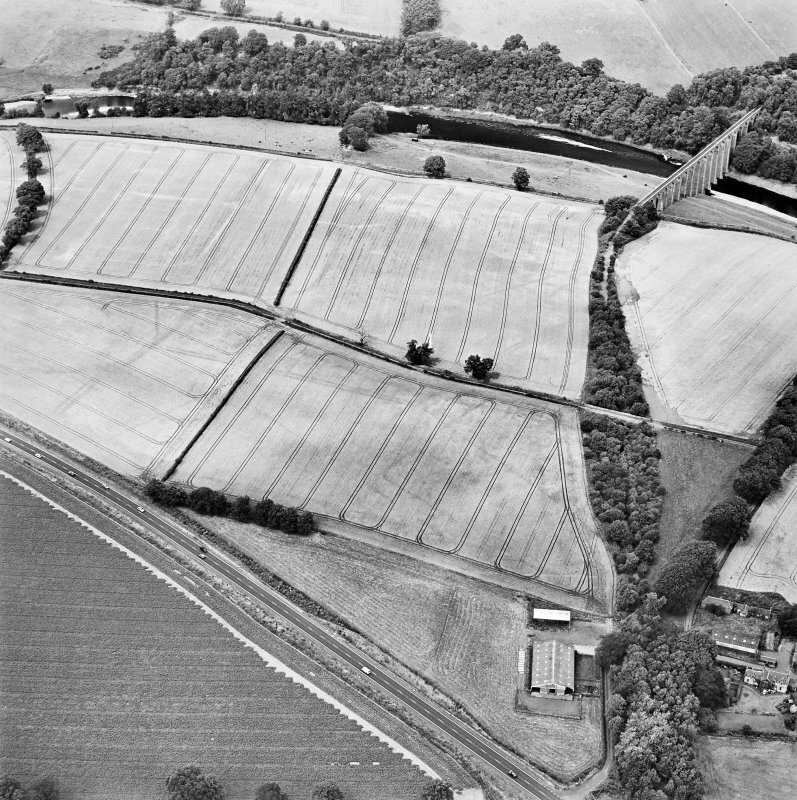 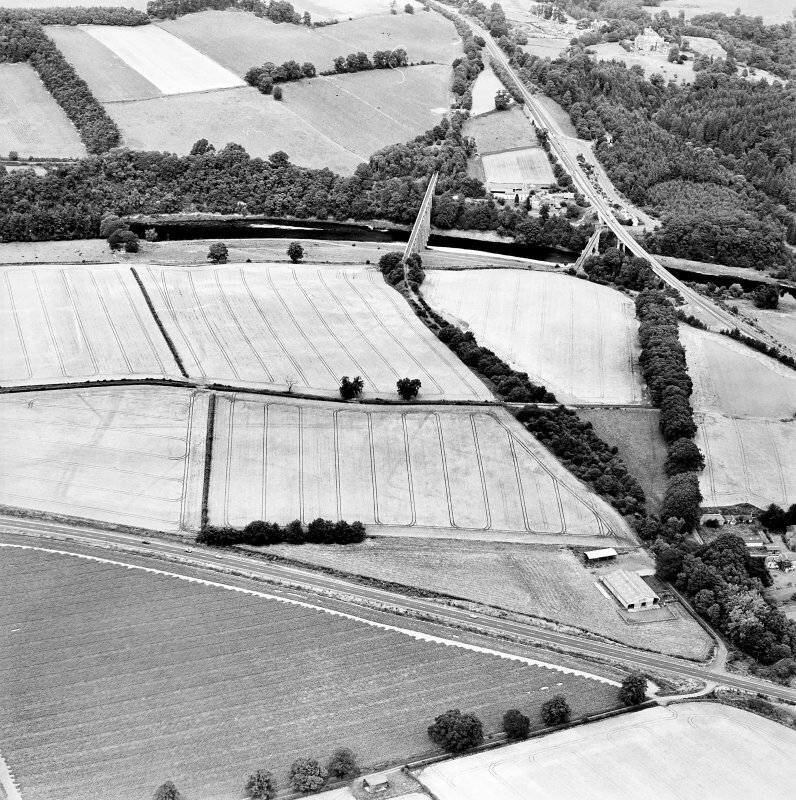 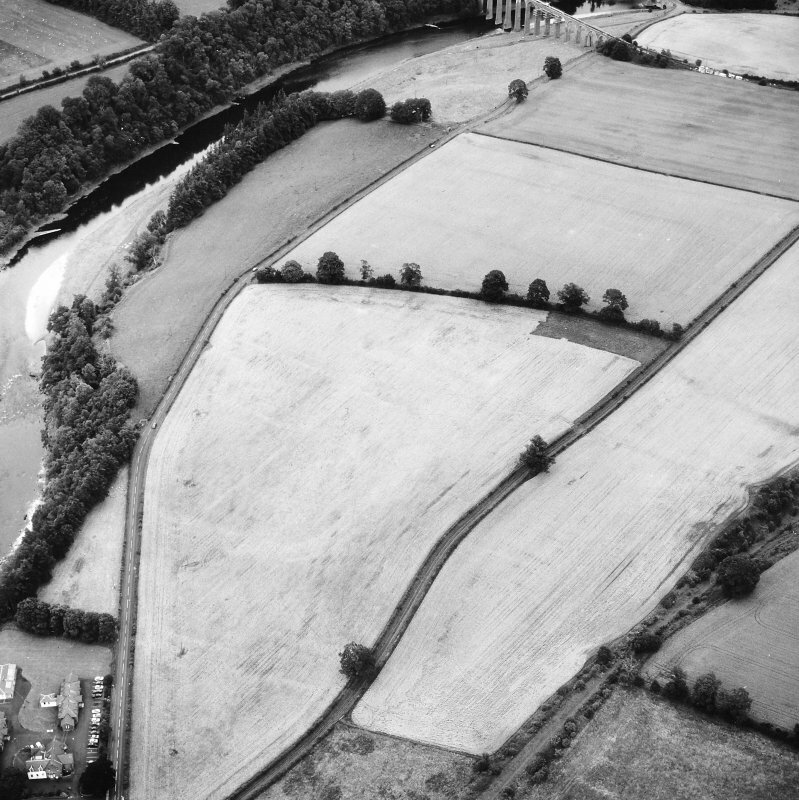 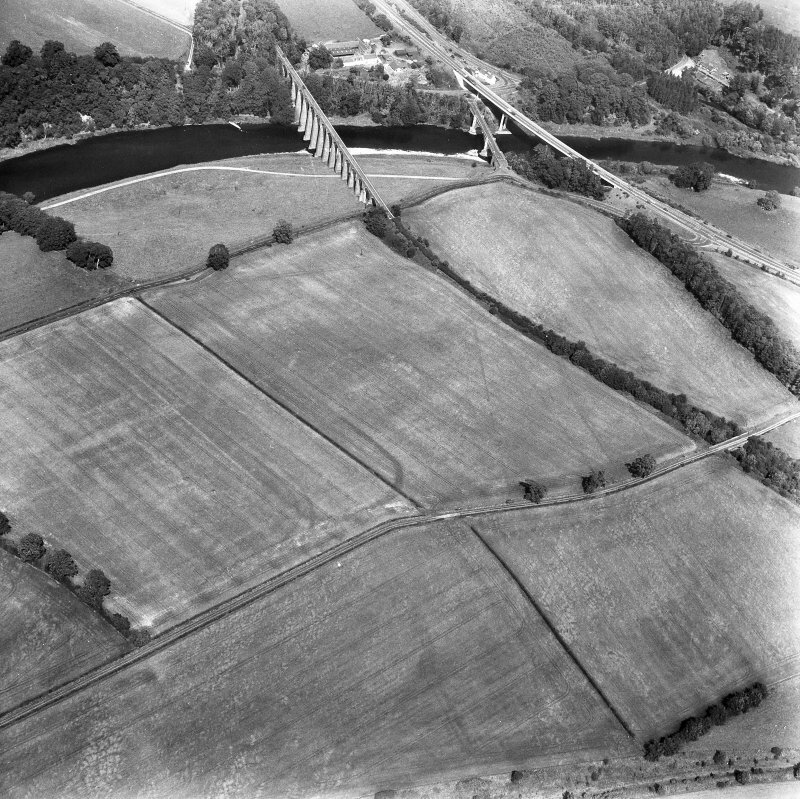 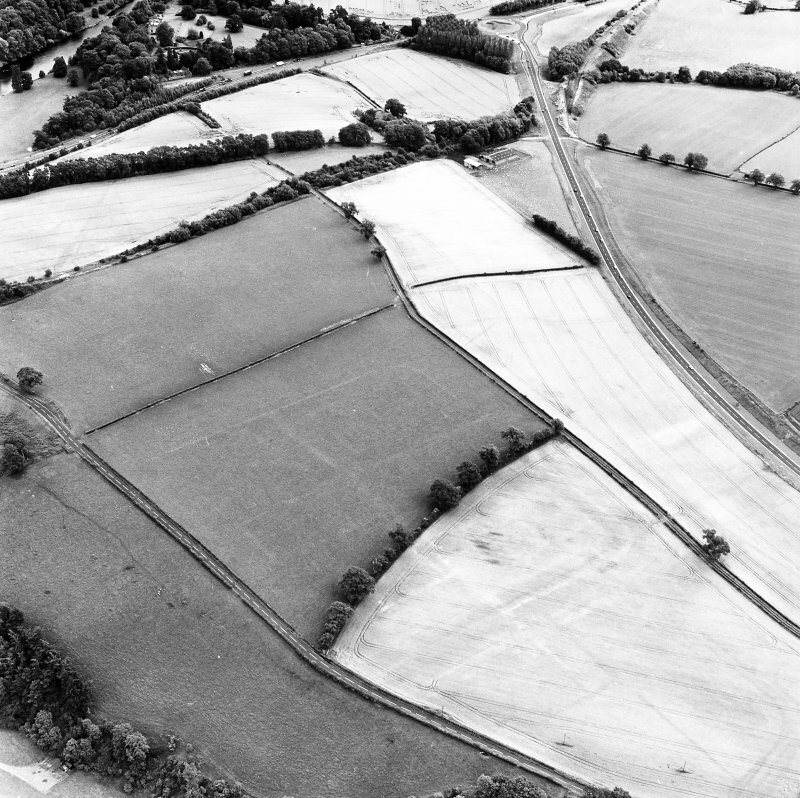 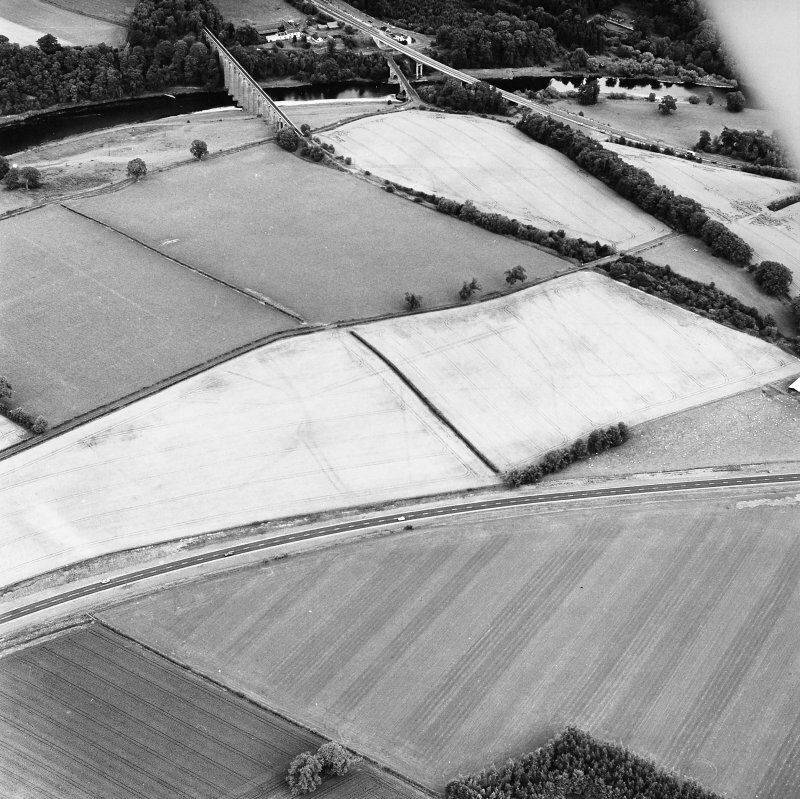 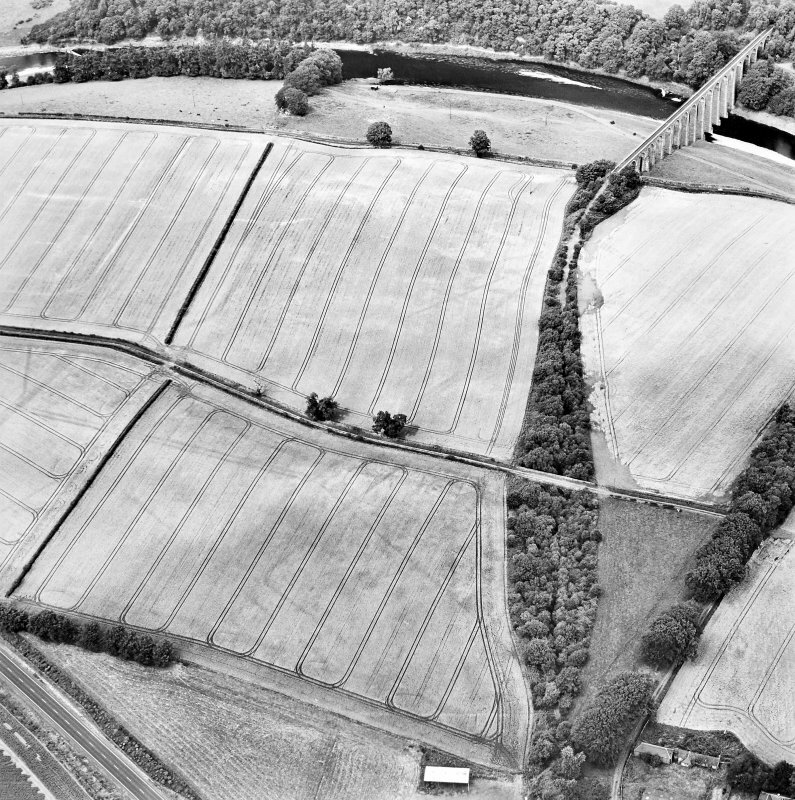 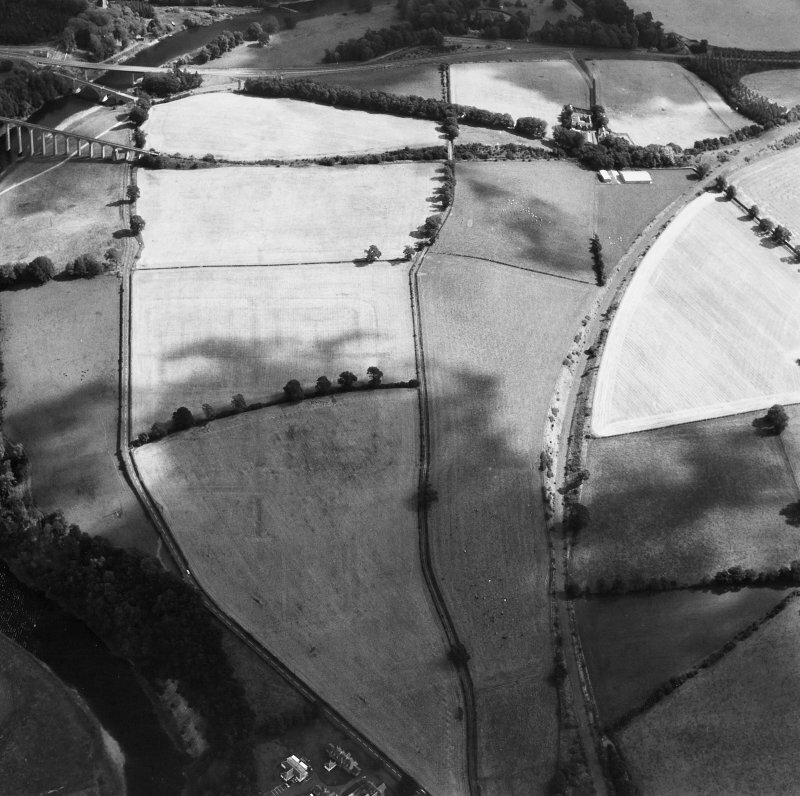 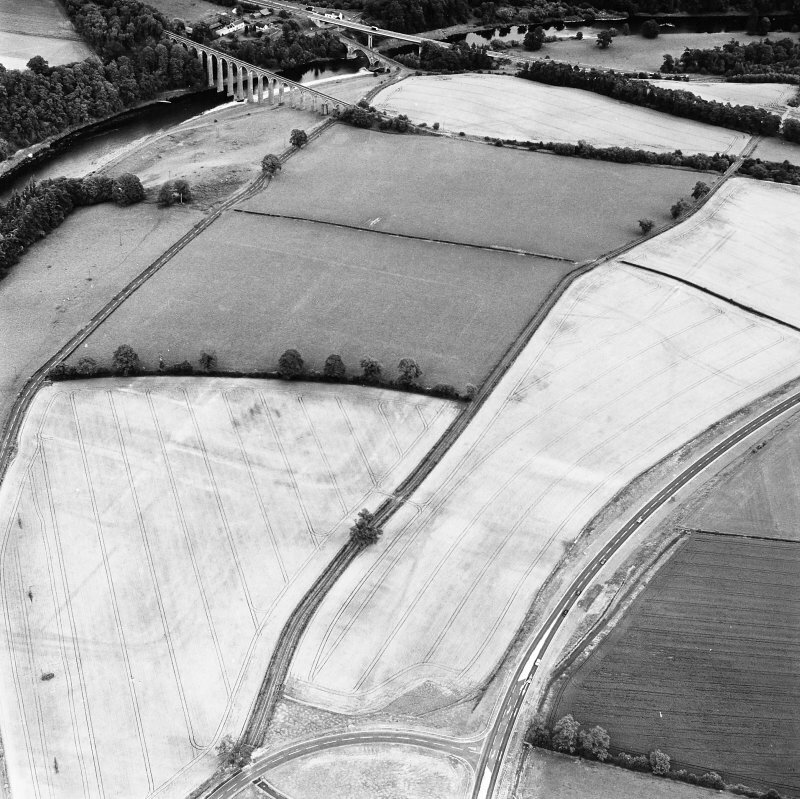 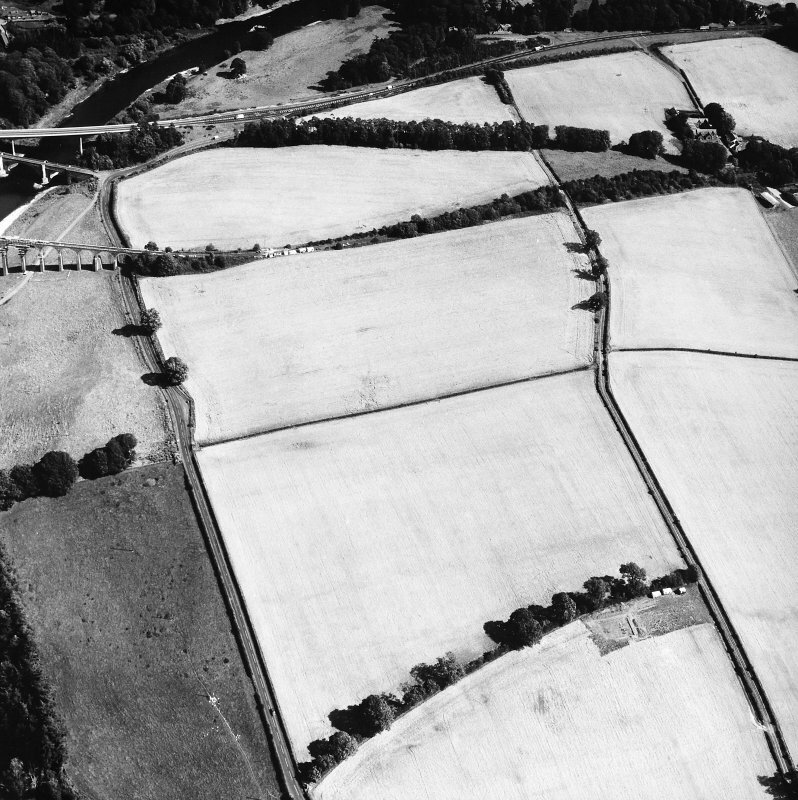 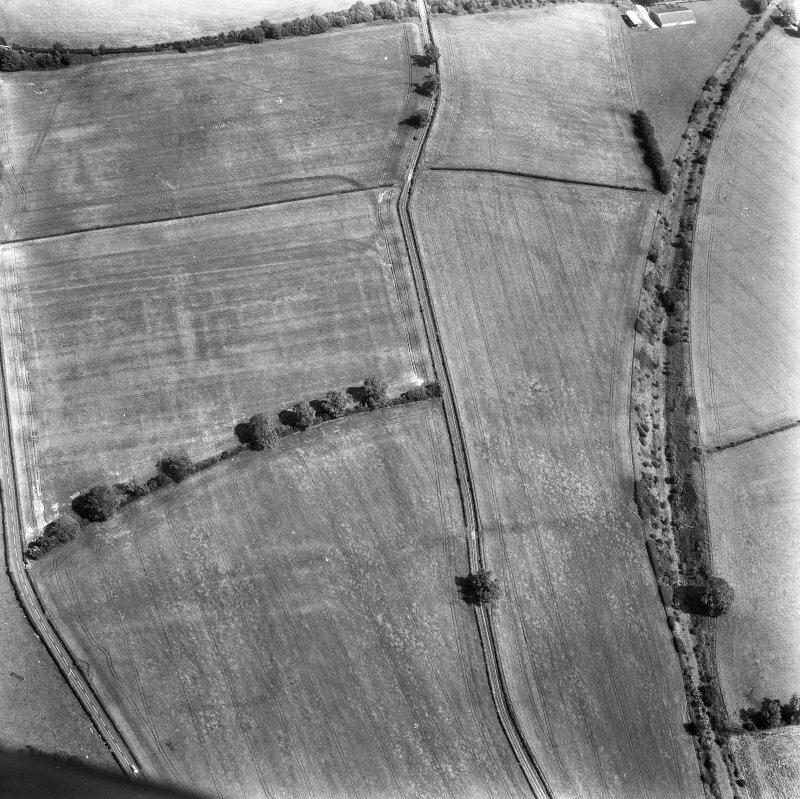 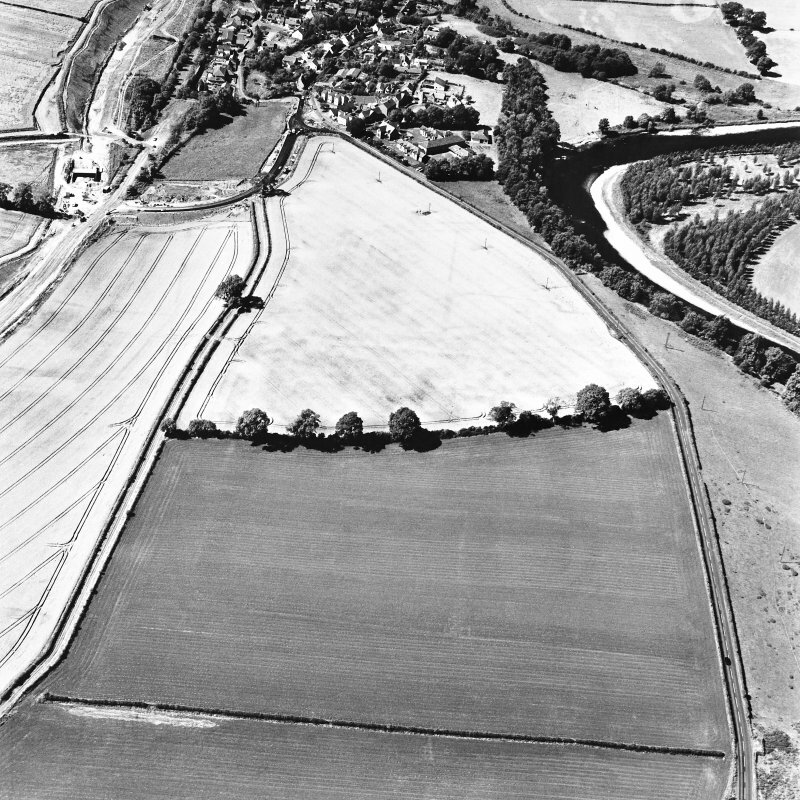 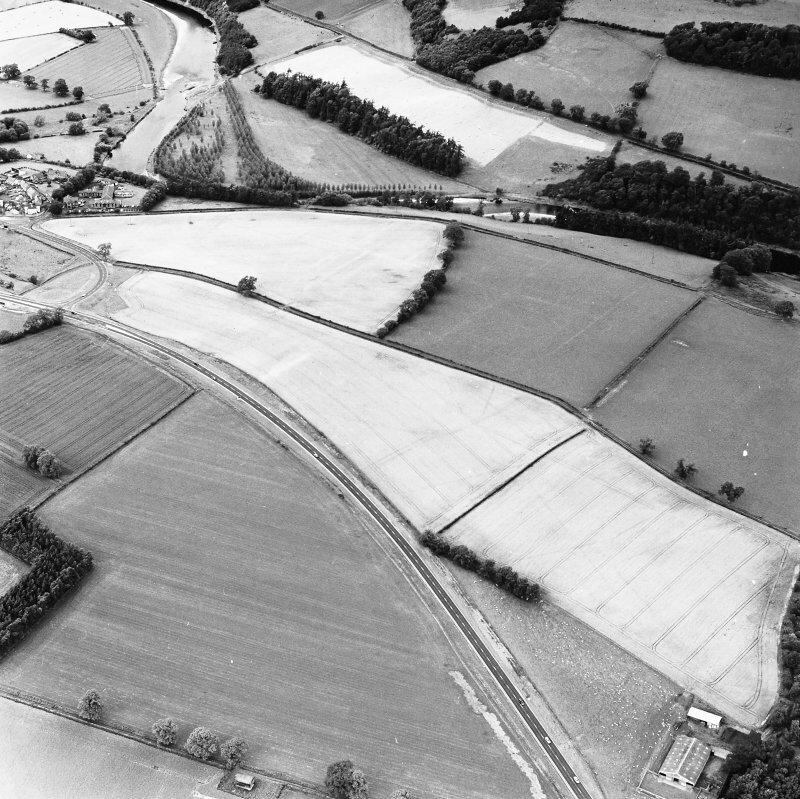 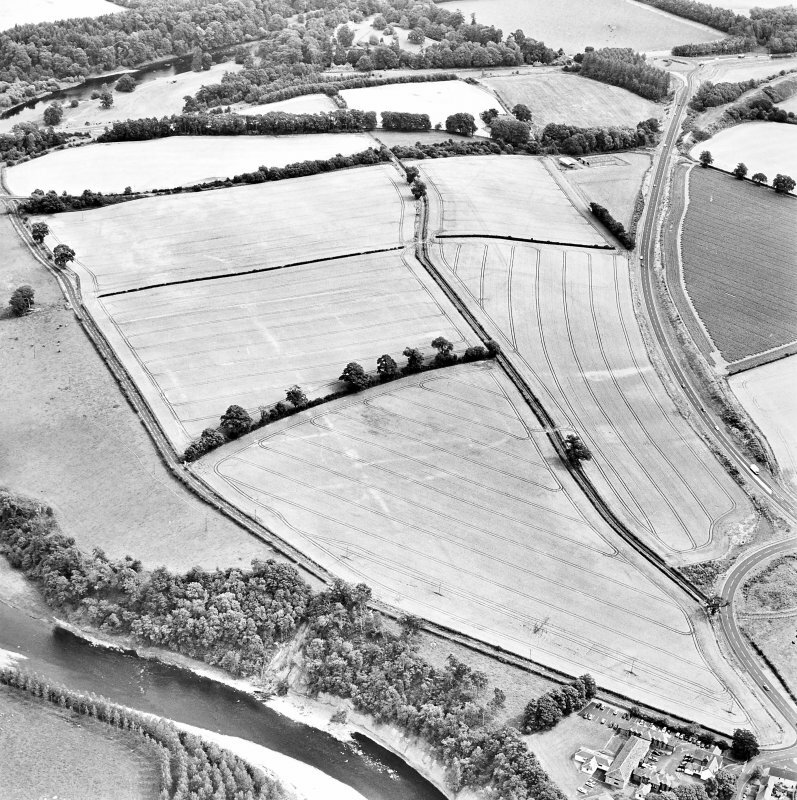 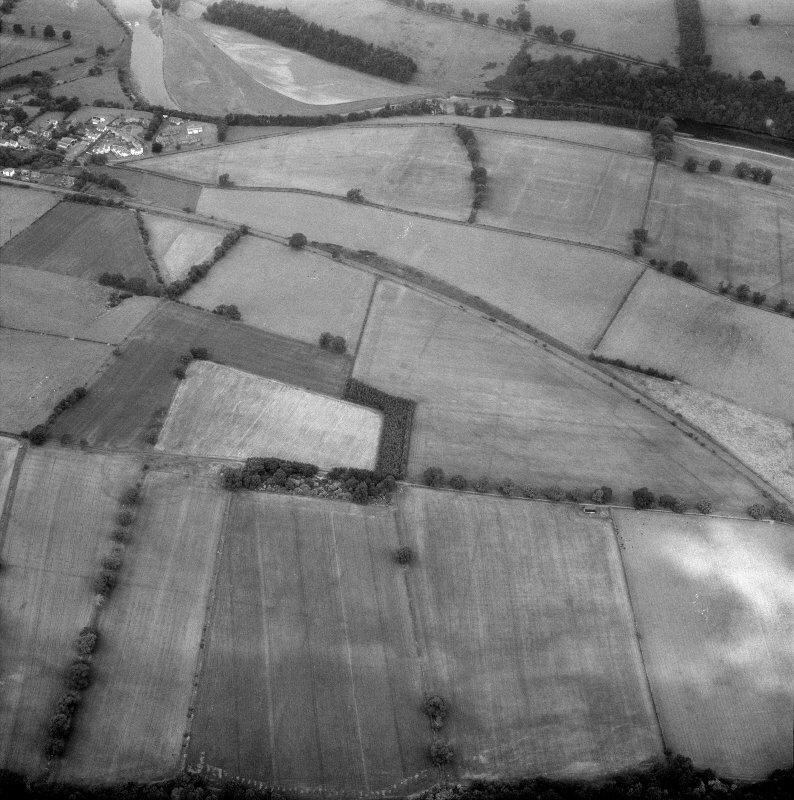 Newstead, Roman fort and temporary camps: air photograph showing fort (NT 569 344) and annexe (NT 571 343). 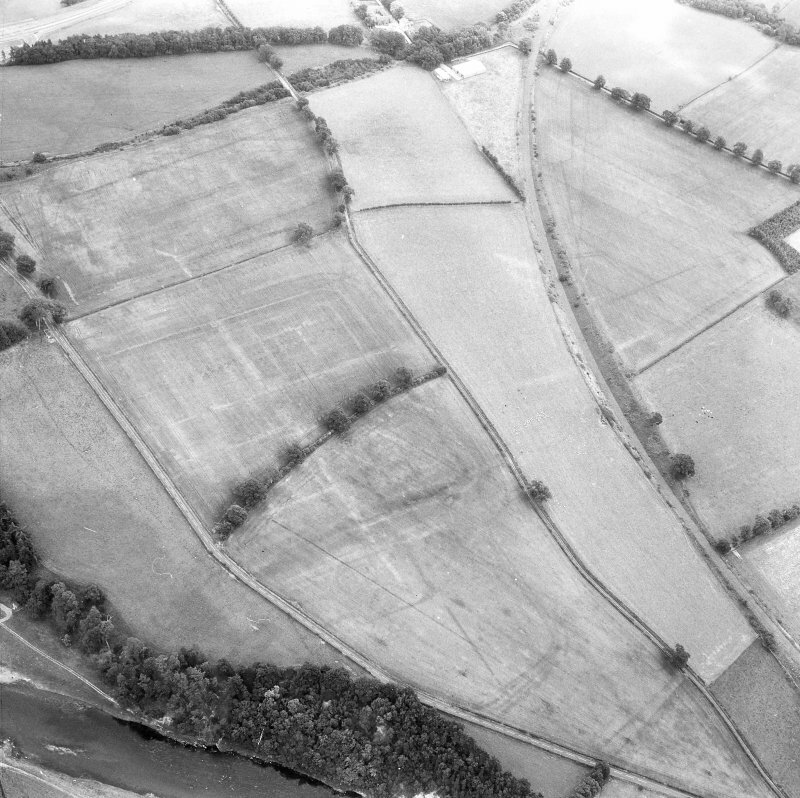 Newstead, oblique aerial view, taken from the N, centred on the Roman fort and the western and southern annexes. 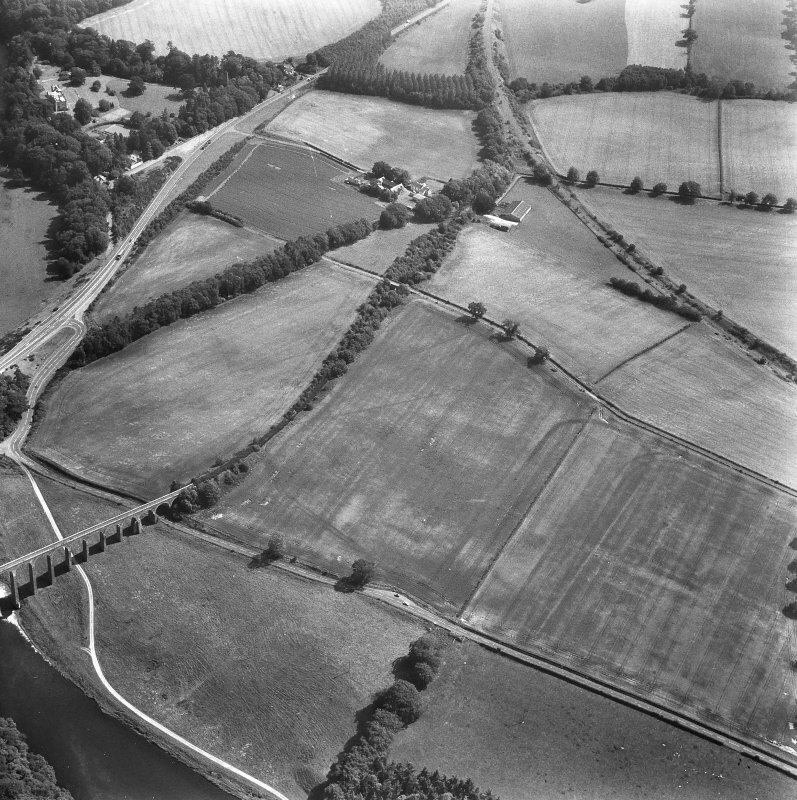 The Newstead by-pass (under construction) is visible in the top half of the photograph. 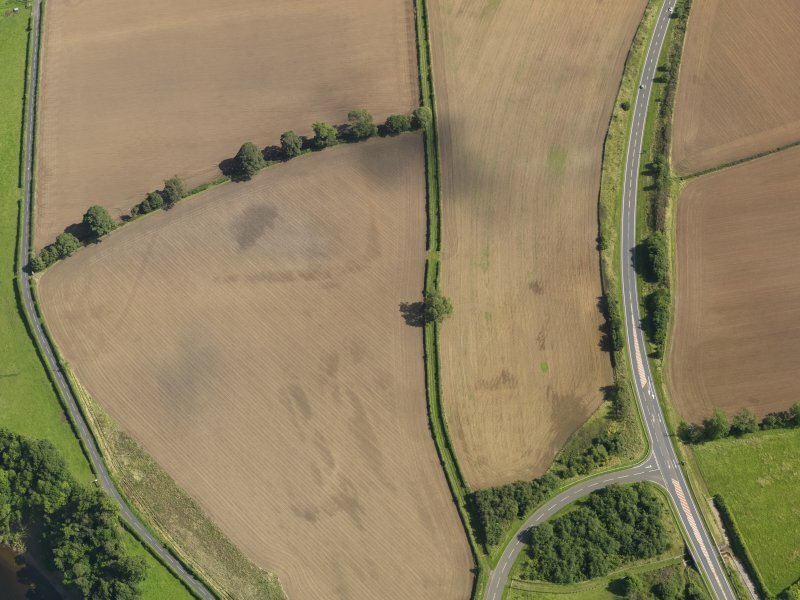 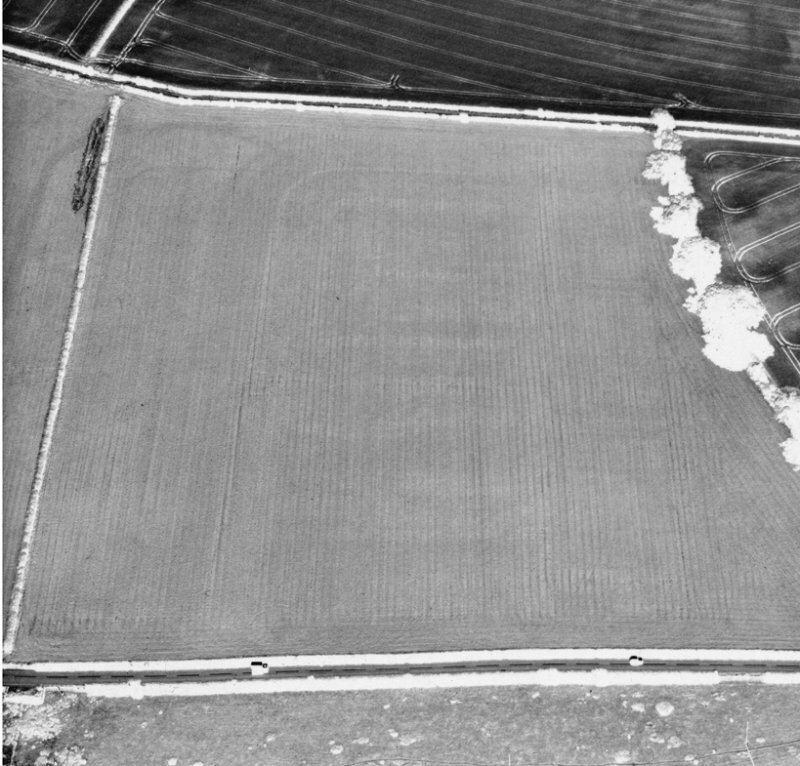 Oblique aerial view of the soilmarks of the W ditch of Newstead Roman fort, taken from the W.
Oblique aerial view centred on the cropmarks of the Roman fort and fort annexes, taken from the SW. 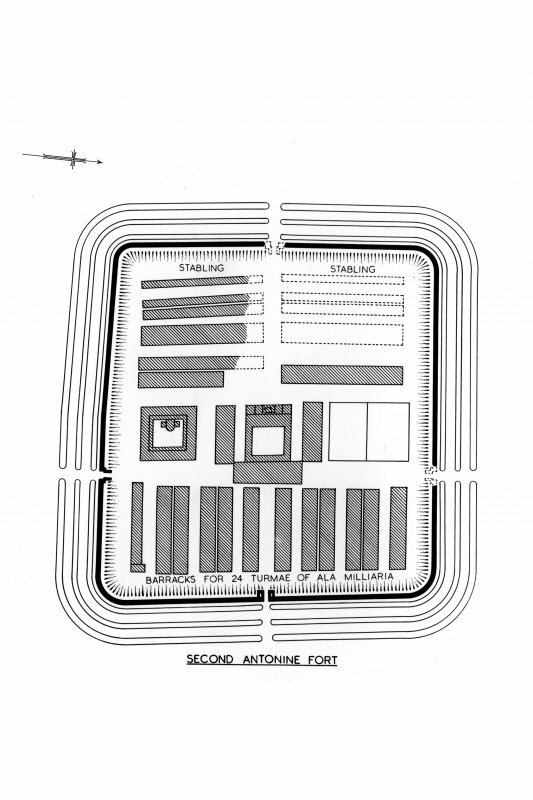 Publication drawings illustrating the different phases of Newstead fort. 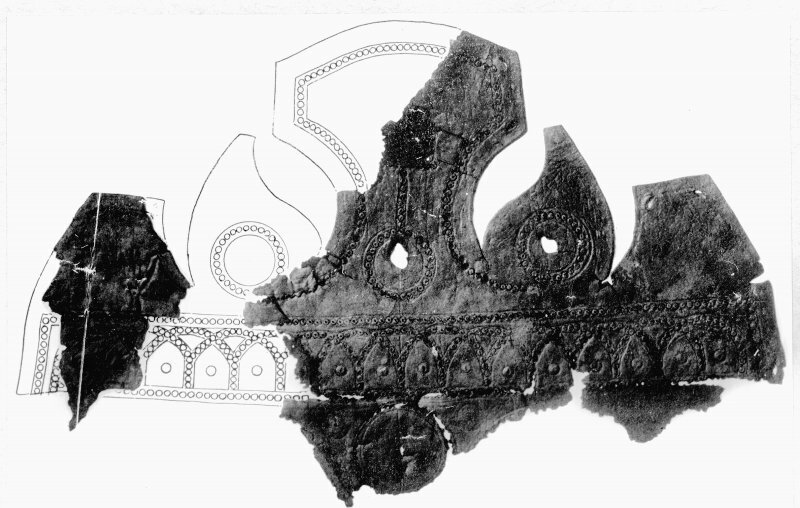 Roxburgh Inventory fig. 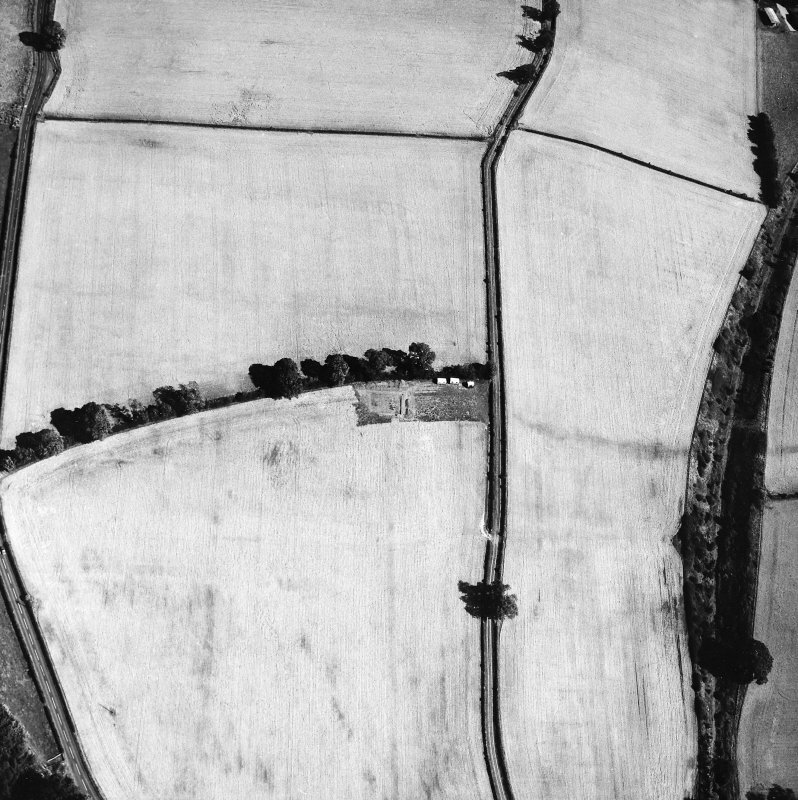 424. 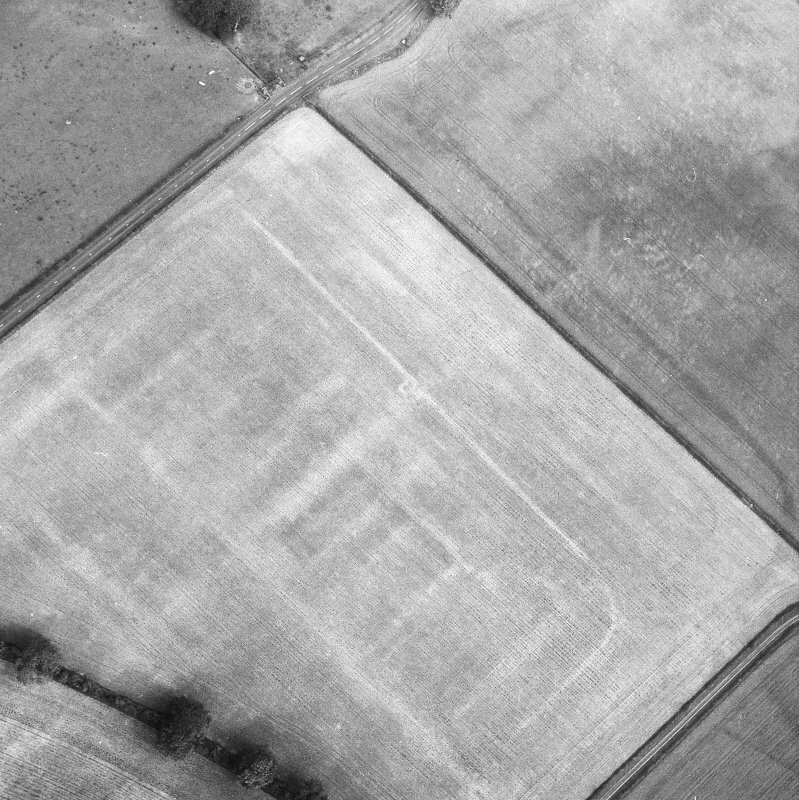 Oblique aerial view of Newstead centred on the cropmarks of the Roman fort, eastern and southern annexes, enclosure and Roman temporary camps, taken from the SE. 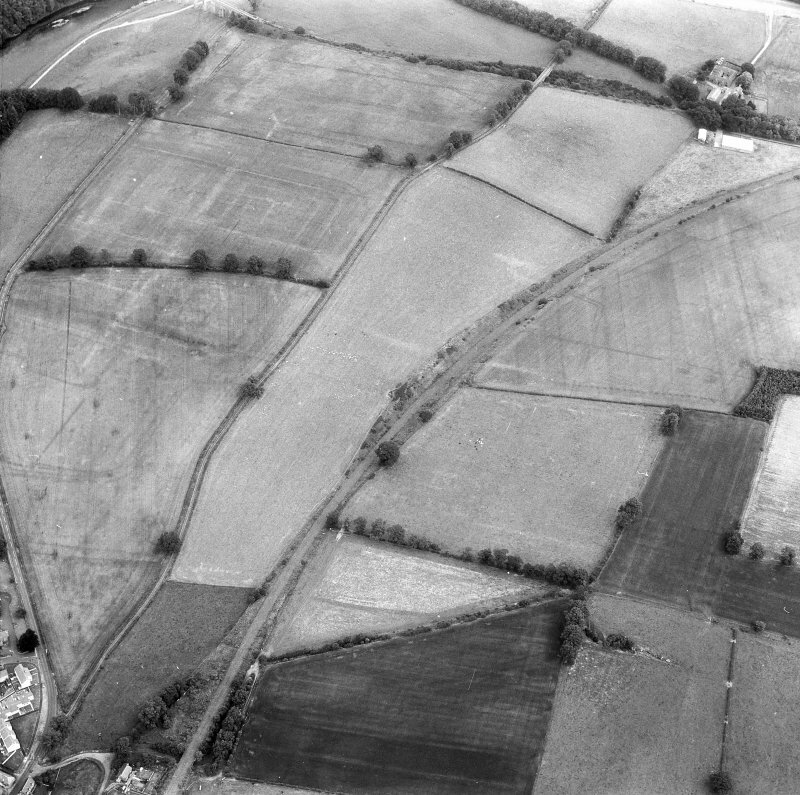 Newstead, oblique aerial view, taken from the SE, centred on the cropmarks of the Roman Fort and Southern Annexe. 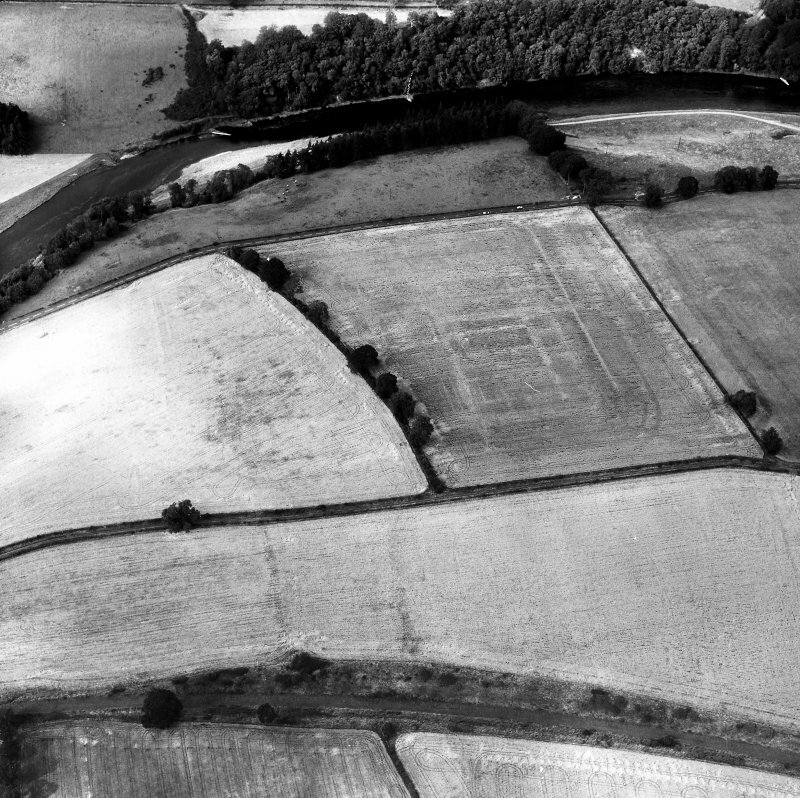 Newstead, oblique aerial view, taken from the NW, centred on the cropmarks of the Roman Fort and Eastern Annexe. 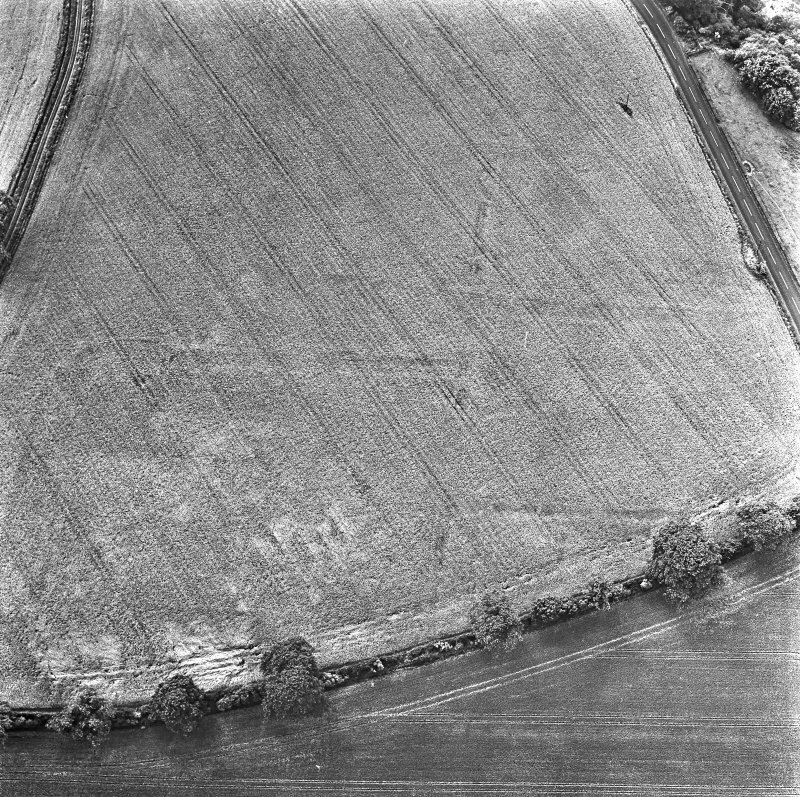 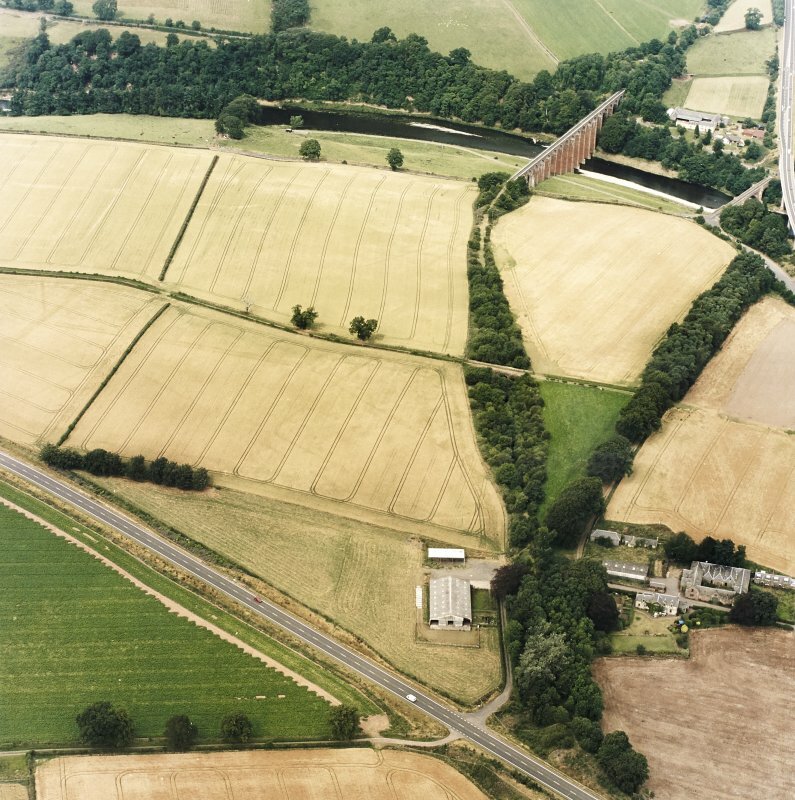 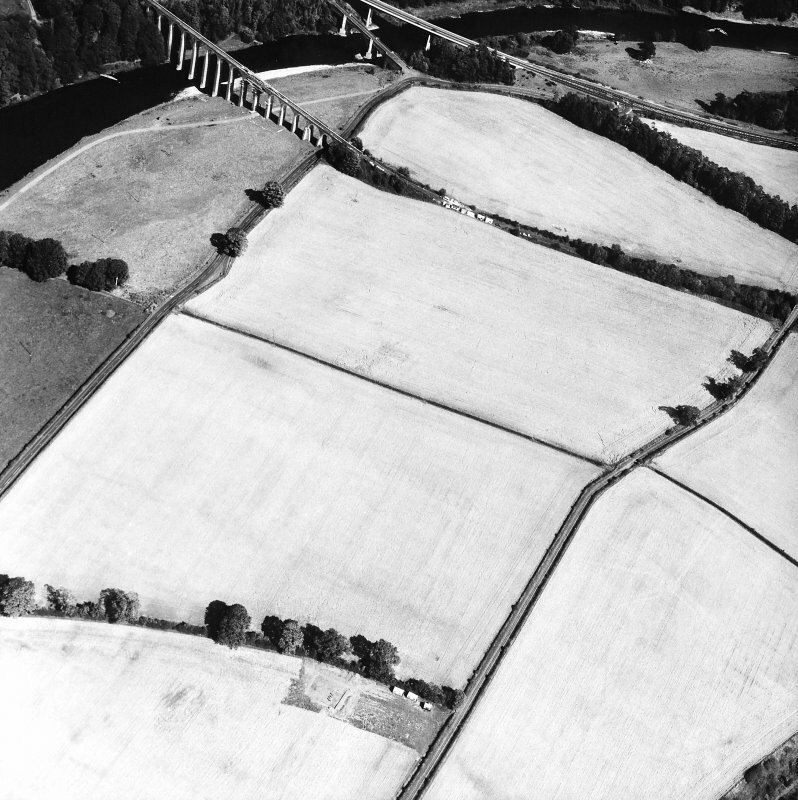 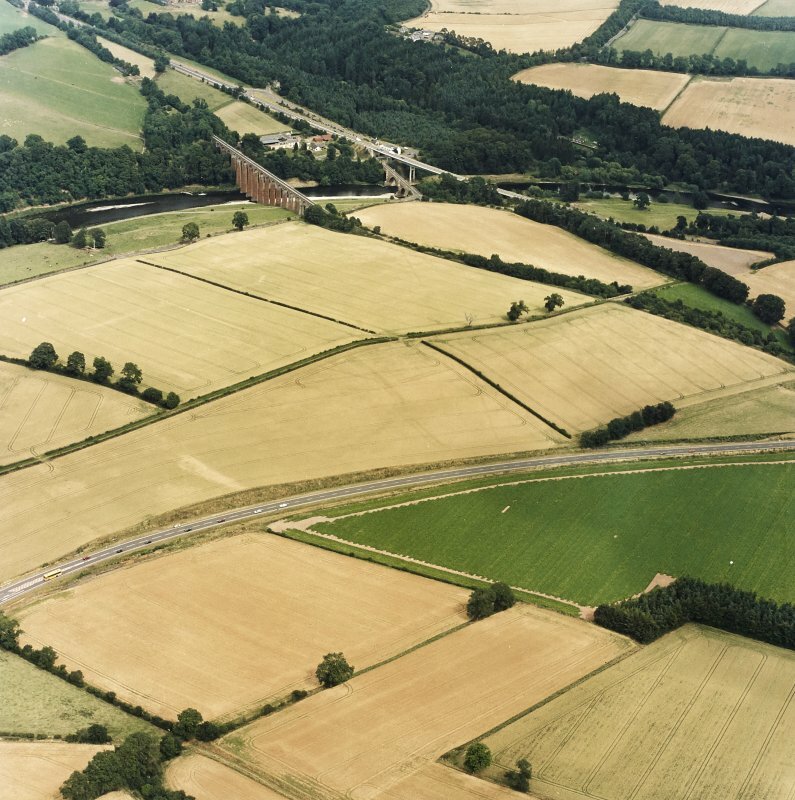 Newstead, oblique aerial view, taken from the NNW, centred on the cropmarks of the Roman Fort. 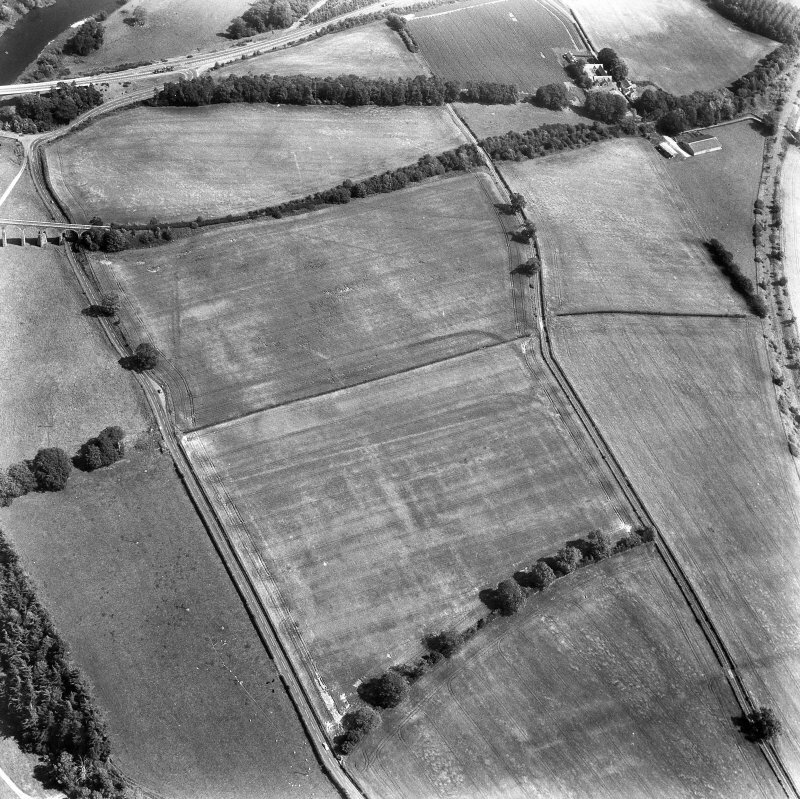 Newstead, oblique aerial view, taken from the SE, centred on the Roman fort and the western and southern annexes. 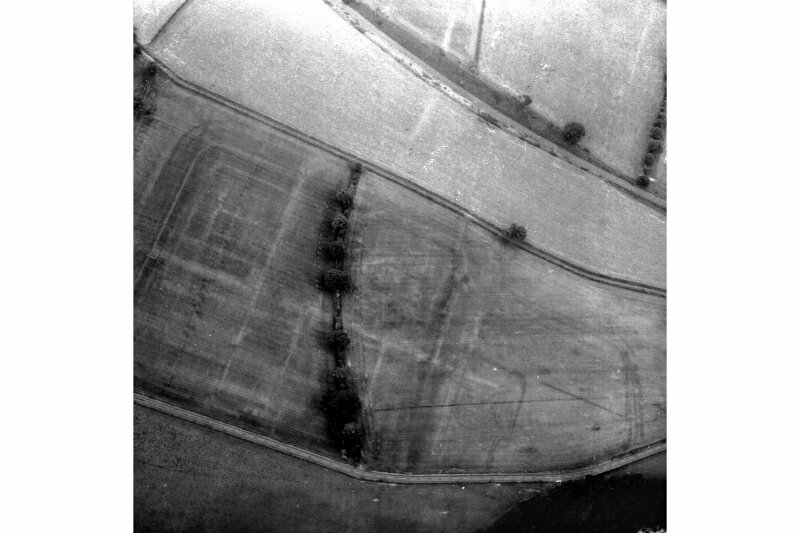 Newstead, Roman fort and temporary camps: air photograph showing fort (NT 569 344), Southern annexe (NT 569 341), Eastern annexe (NT 572 343), annexe (NT 571 343), possible annexe (NT 570 346) and 'Great camp' complex of temporary camps (NT 574 341). 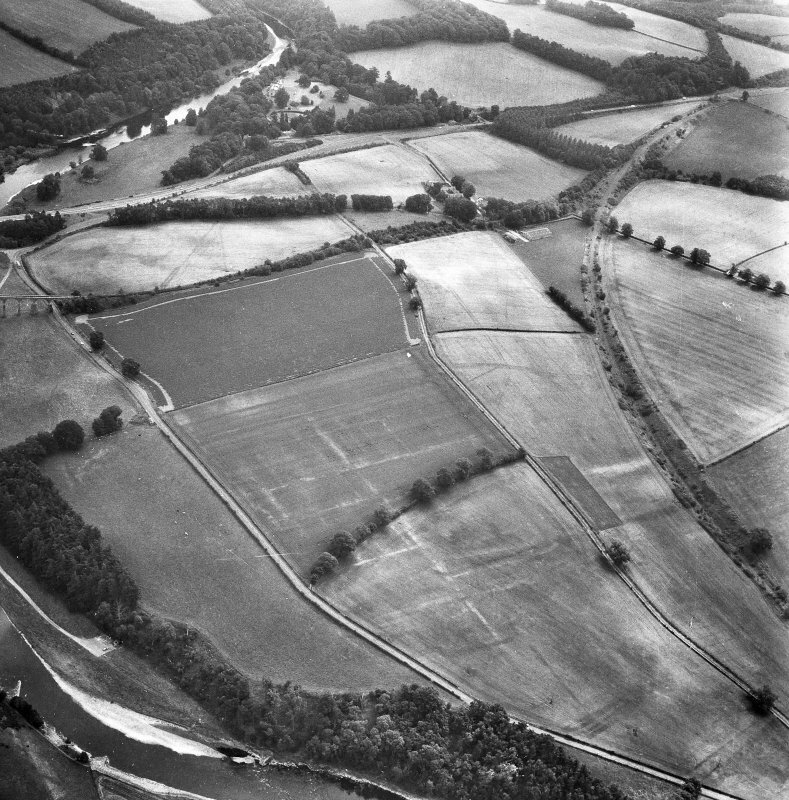 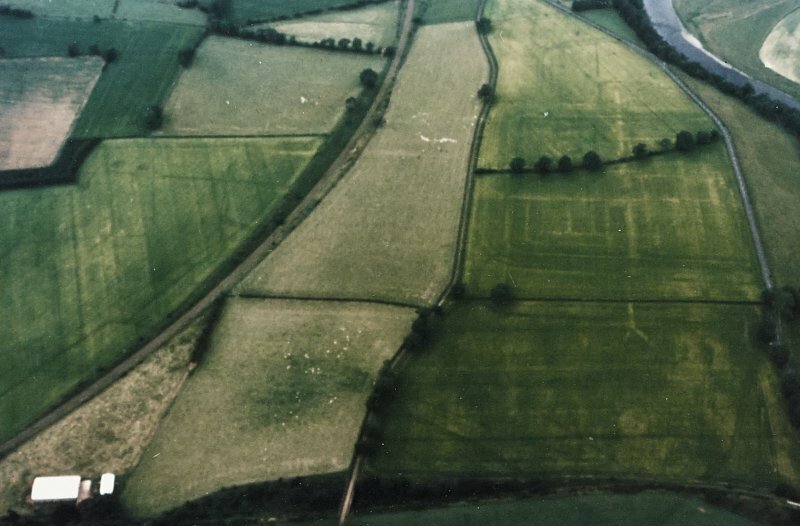 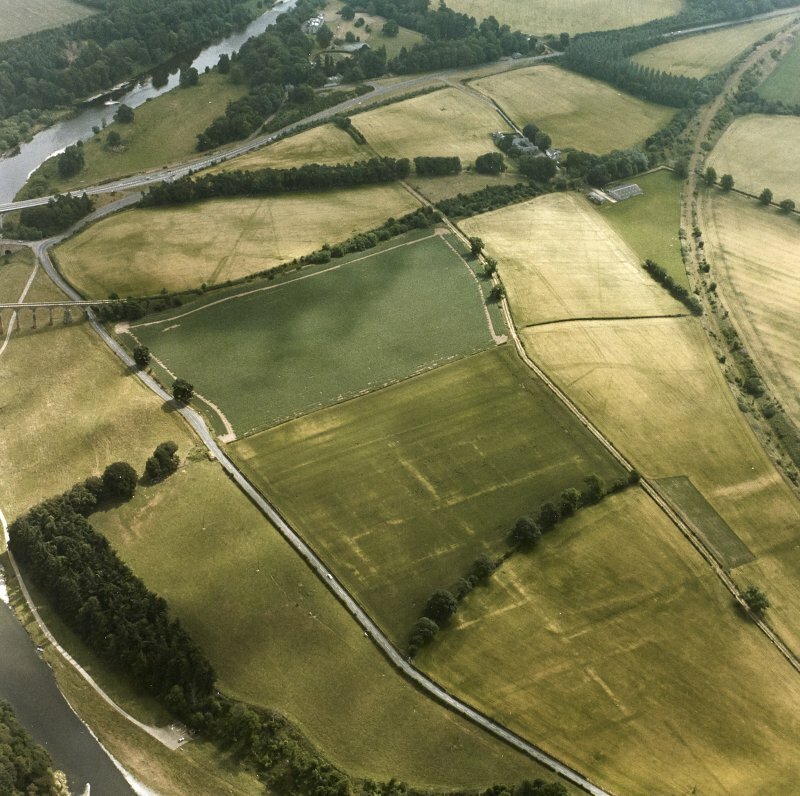 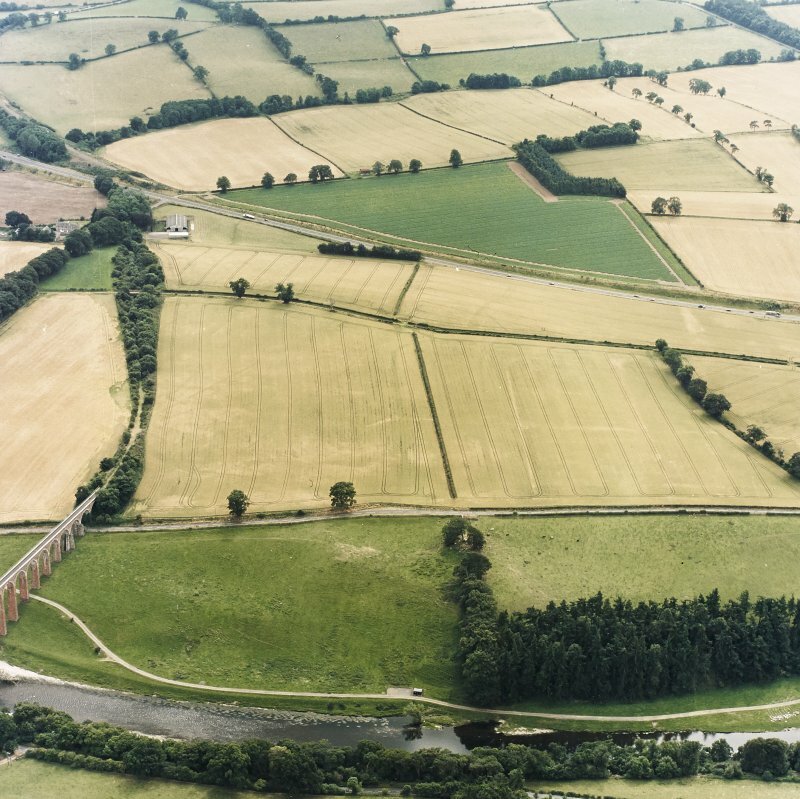 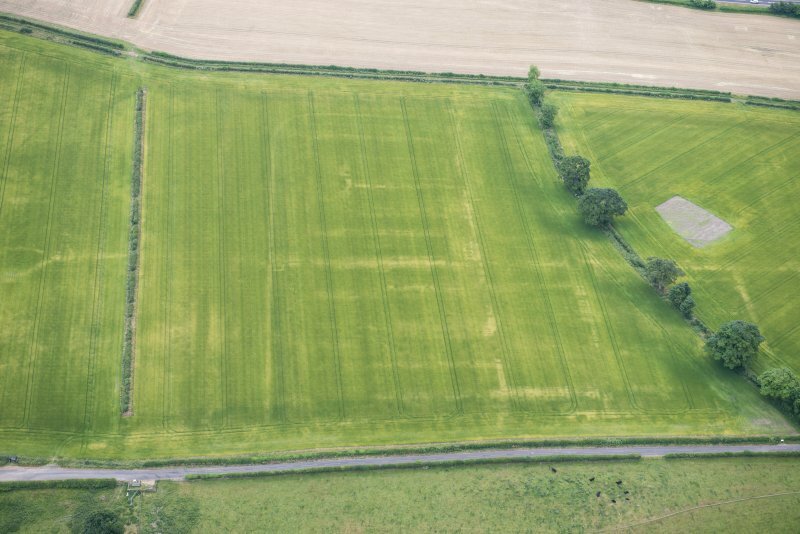 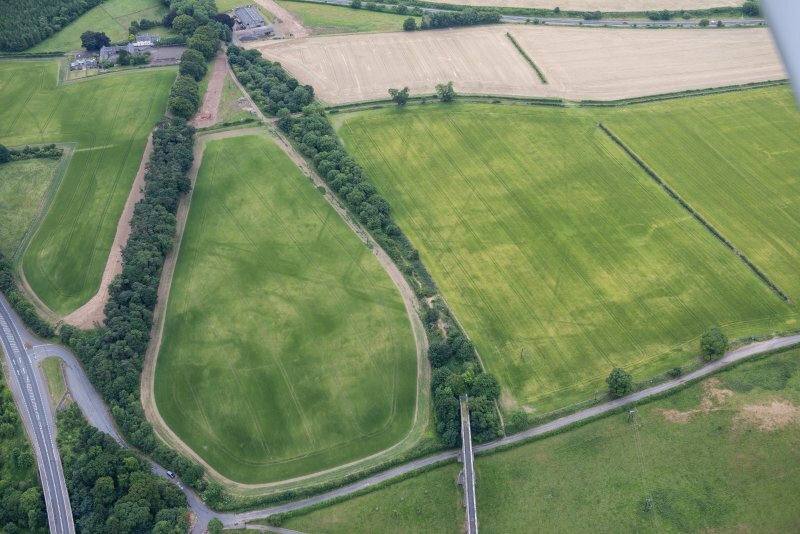 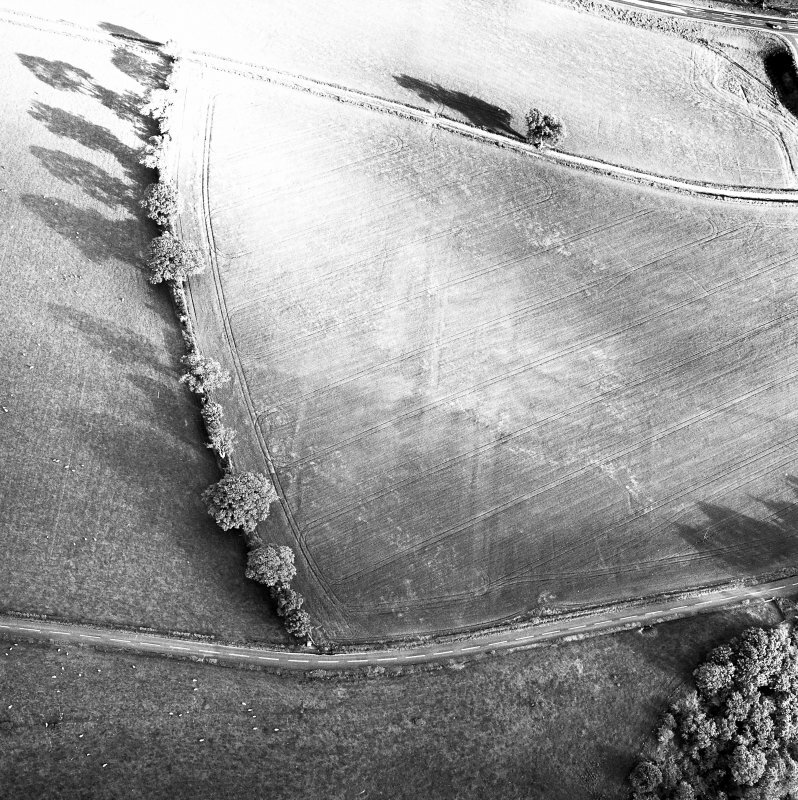 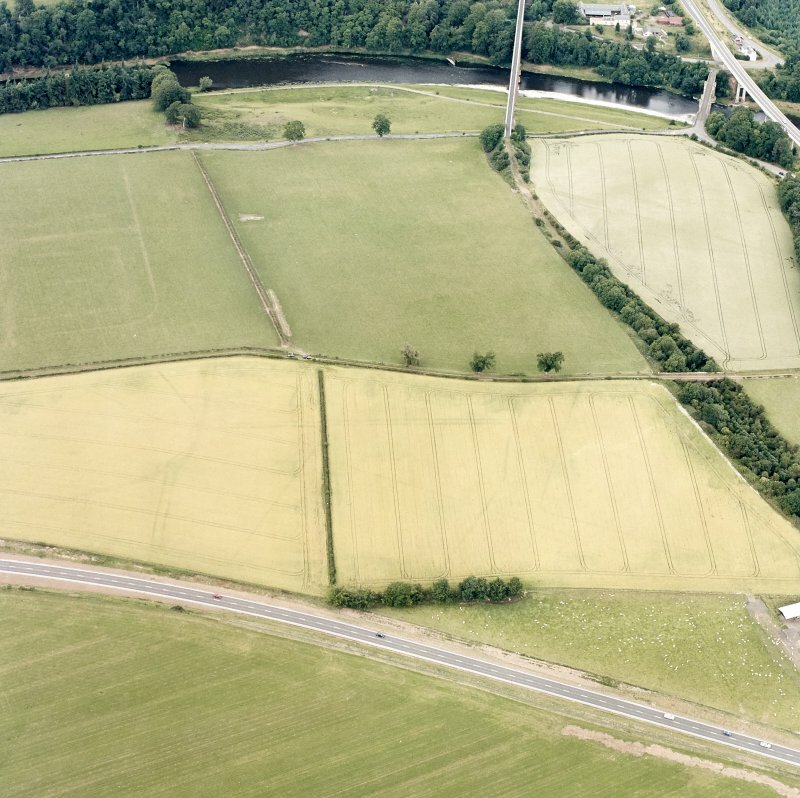 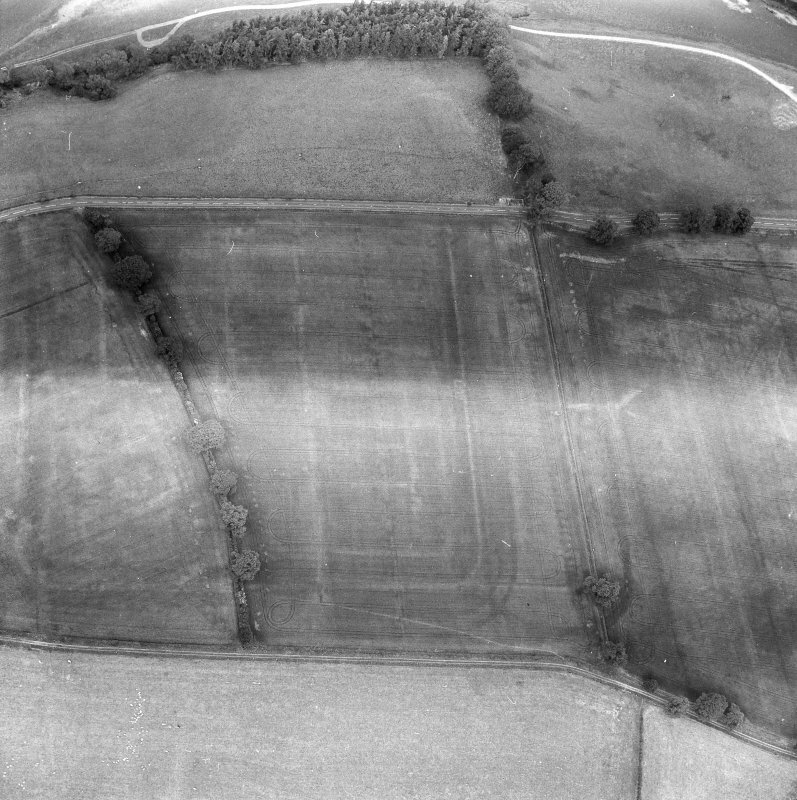 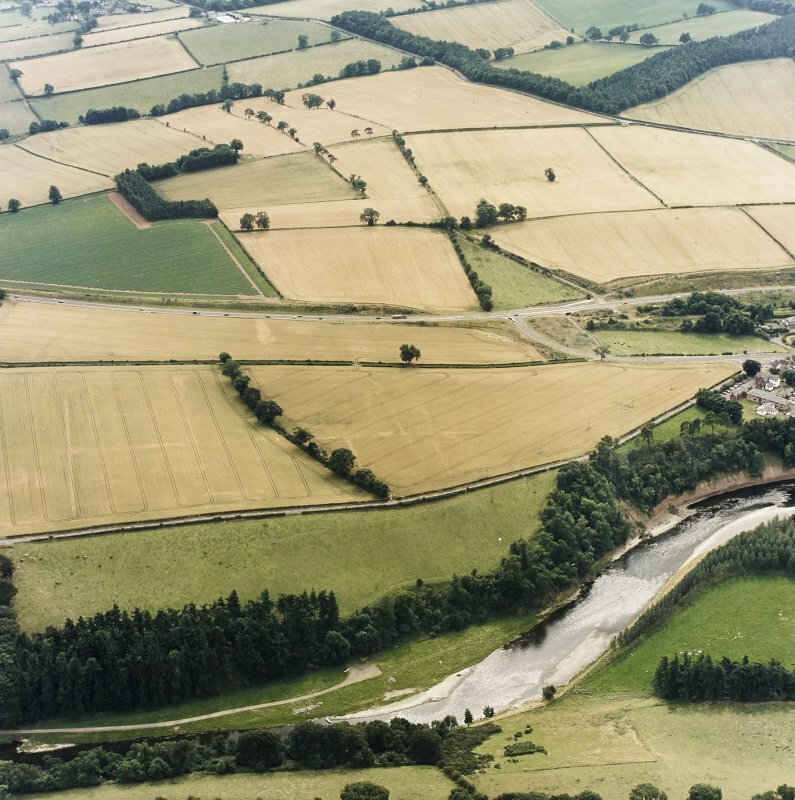 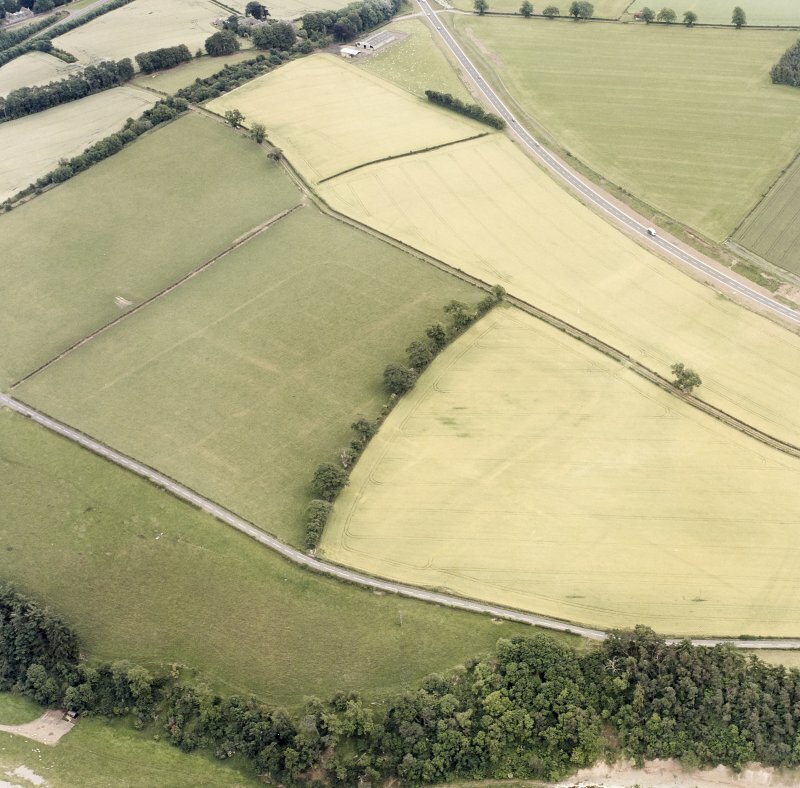 Newstead, Roman fort and temporary camps: air photograph showing fort (NT 569 344), Western annexe (NT 567 343), 160-acre temporary camp (NT 567 337) and linear feature (NT 565 341). 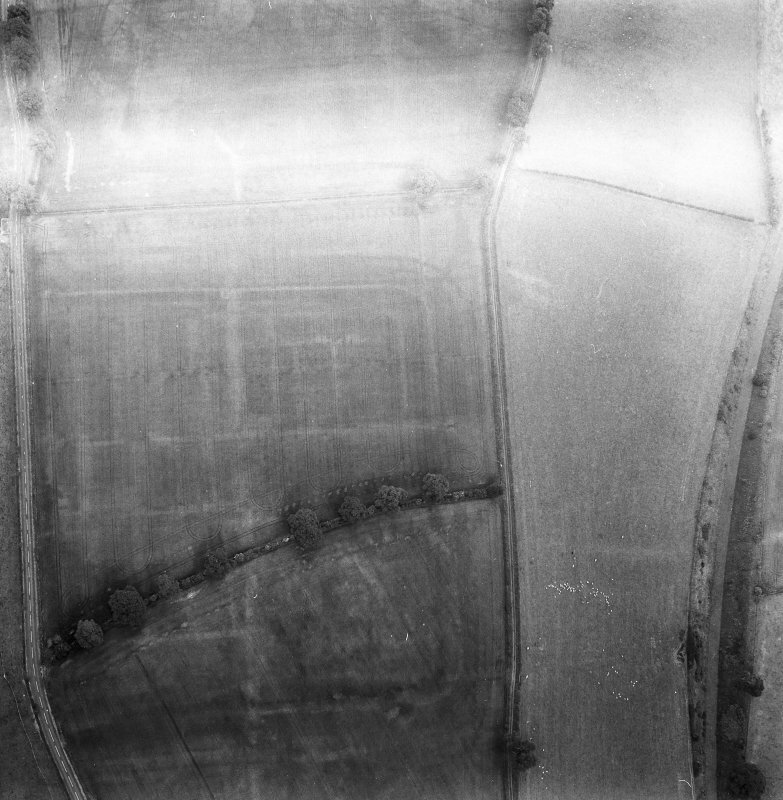 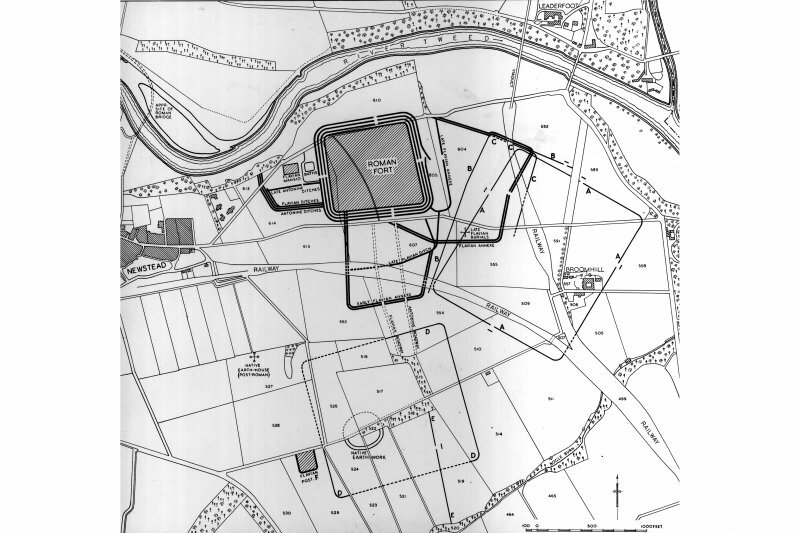 Newstead, Roman fort and temporary camps: air photograph showing fort (NT 569 344), Southern annexe (NT 569 341), Eastern annexe (NT 572 343), Western annexe (NT 567 343), annexe (NT 571 343), possible annexe (NT 570 346), and 160-acre temporary camp (NT 567 337). 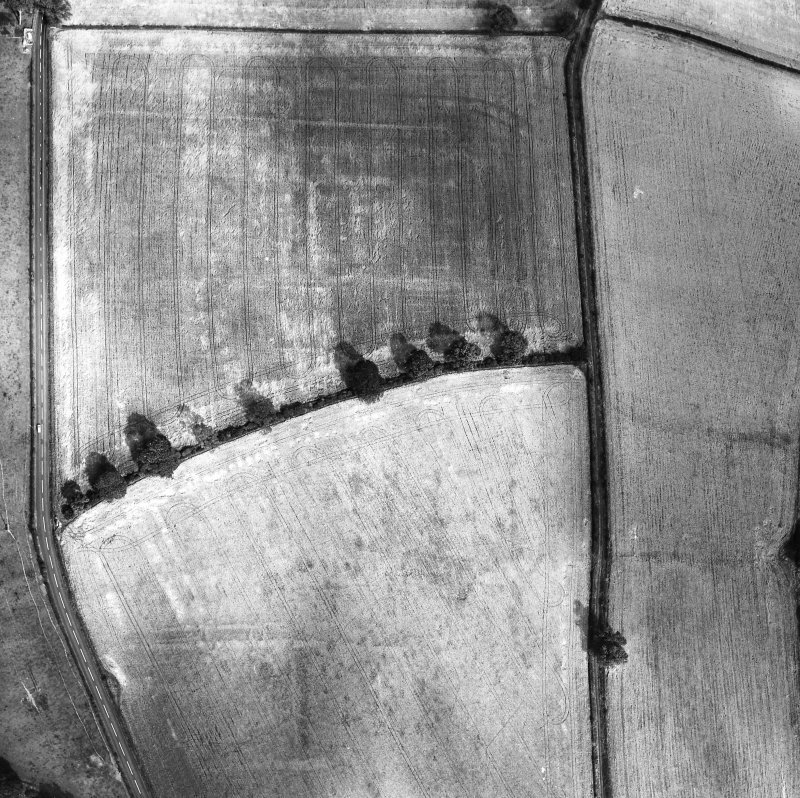 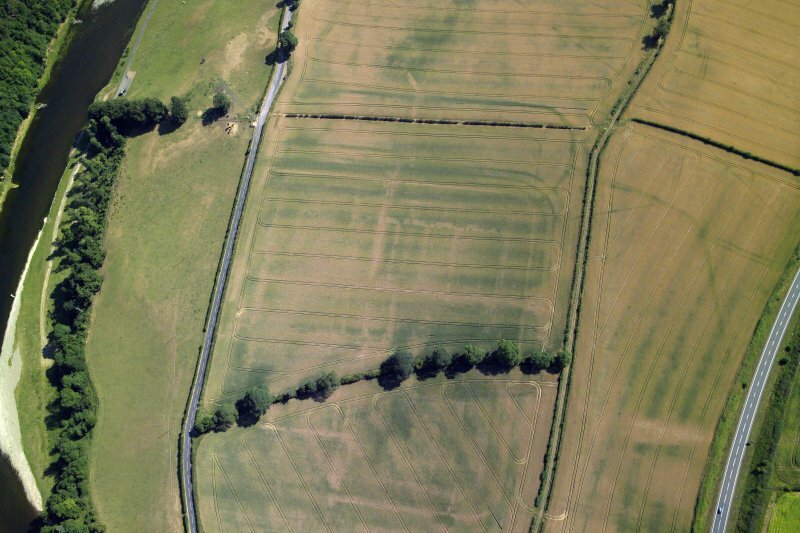 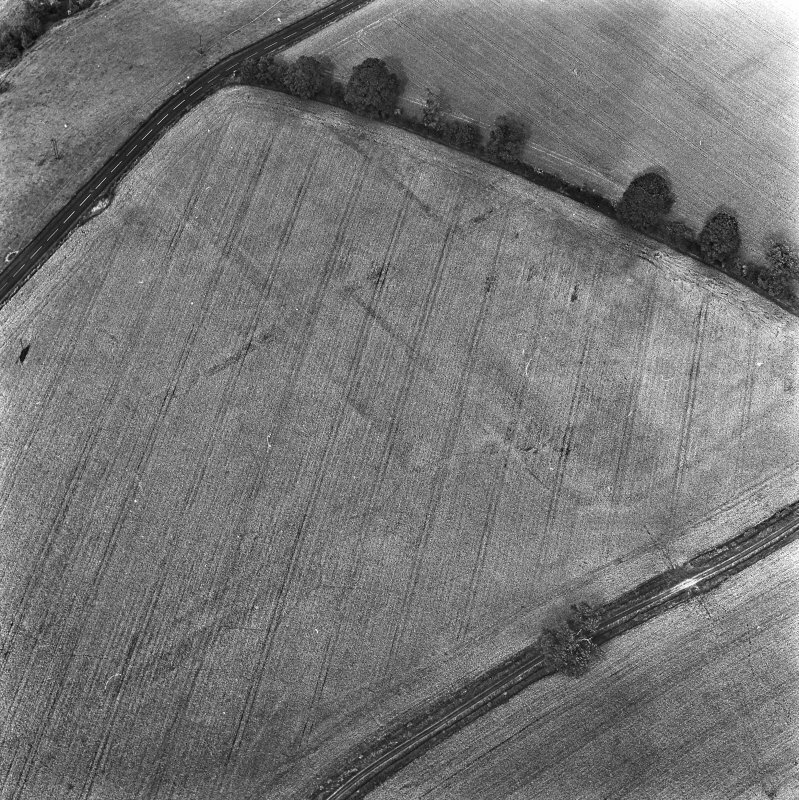 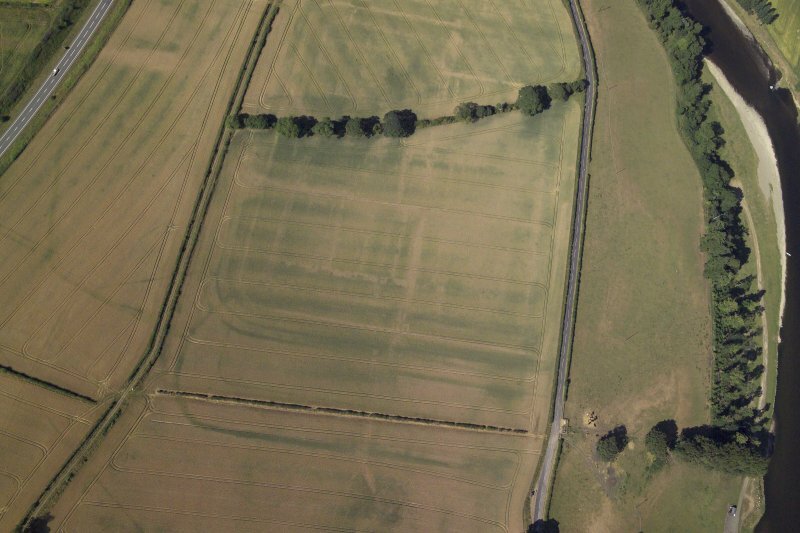 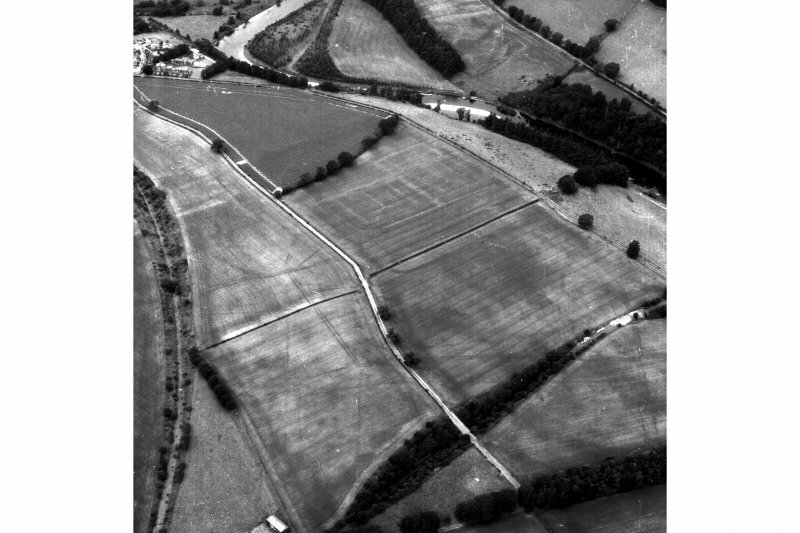 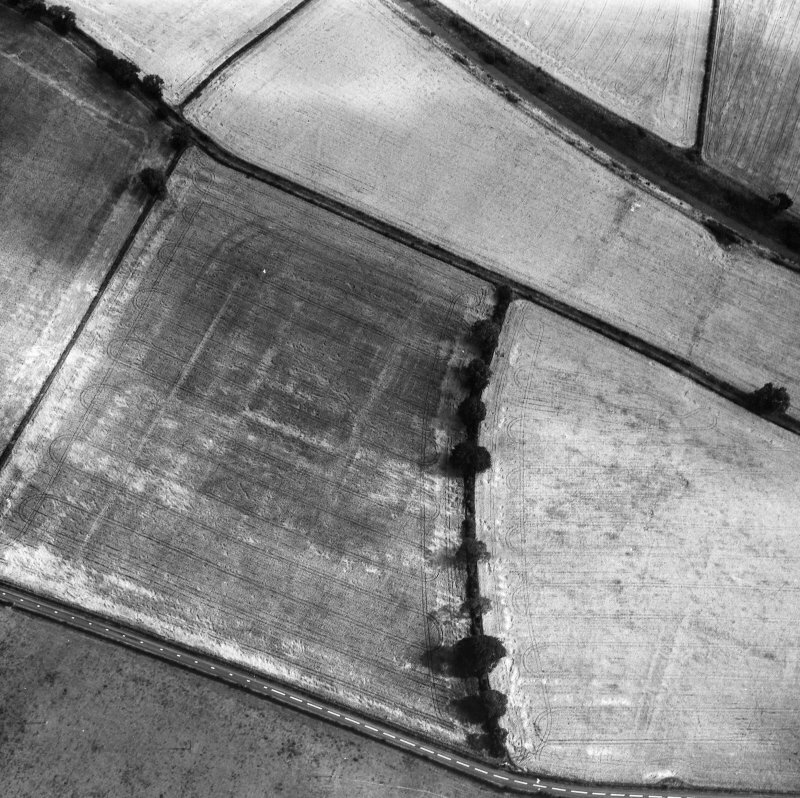 Oblique aerial view of the cropmarks of the Roman fort at Newstead, looking N.